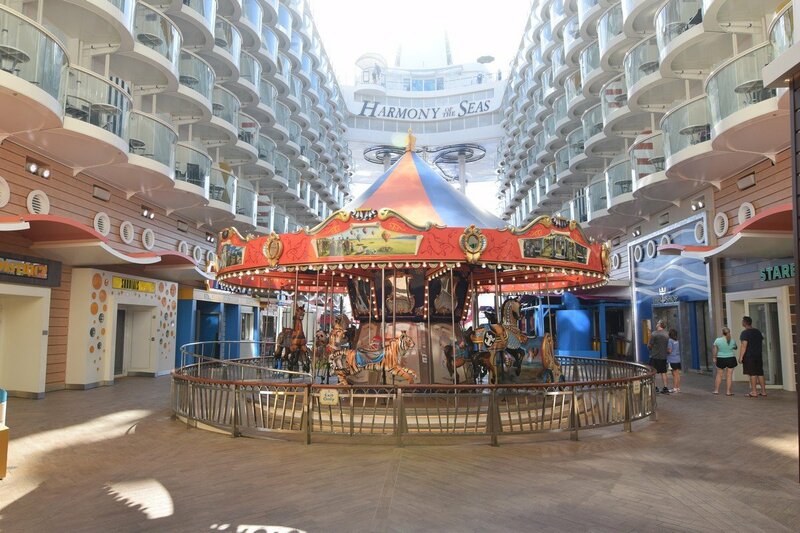 Our final day on board Harmony of the Seas has arrived. This week has gone by so fast; today I had no real plans other than relaxing. 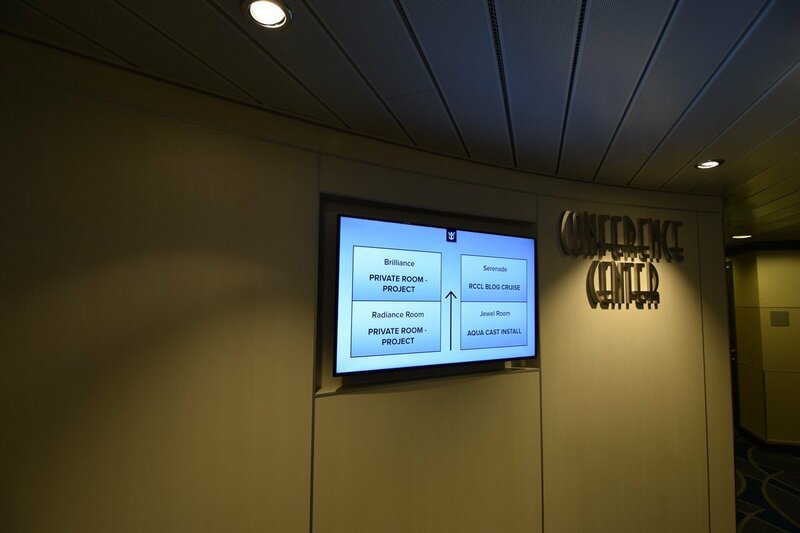 The last official group event was the podcast recording down in the conference room. 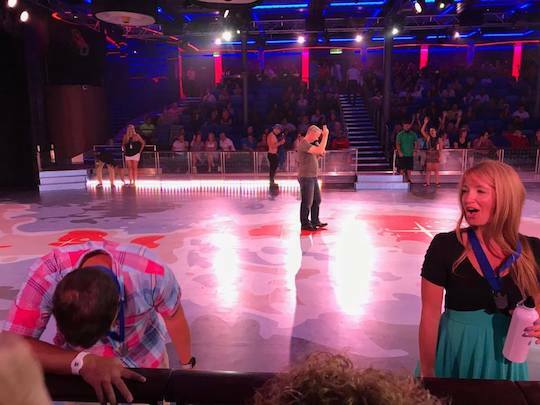 It was fun to recap our cruise in a group setting, while recording. After the recording I wanted to grab some lunch. I had thought about going to Chops Grill for lunch with my Ultimate dining package, but like always I ended up at Sabor. Today I wanted to try the chicken quesadilla, and it was so good. 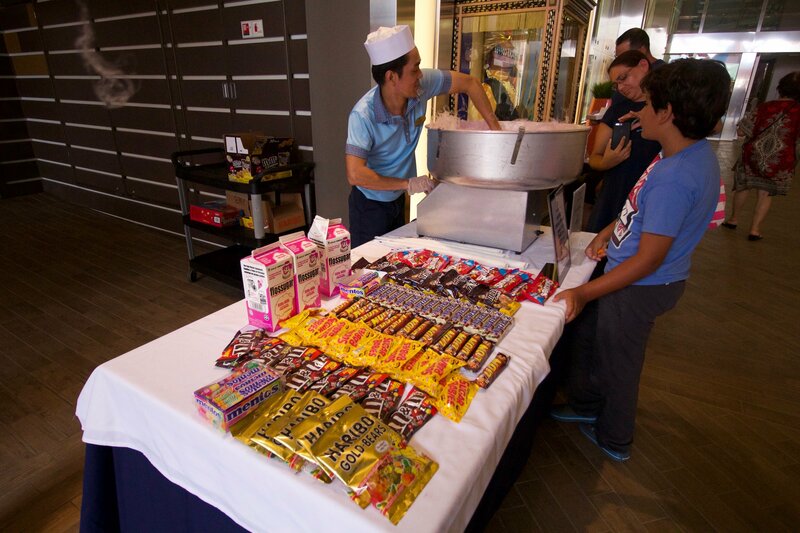 When I left the boardwalk I noticed they had candy and cotton candy for sale. The skittles tempted me, but thought candy was the last thing I needed after Sabor. 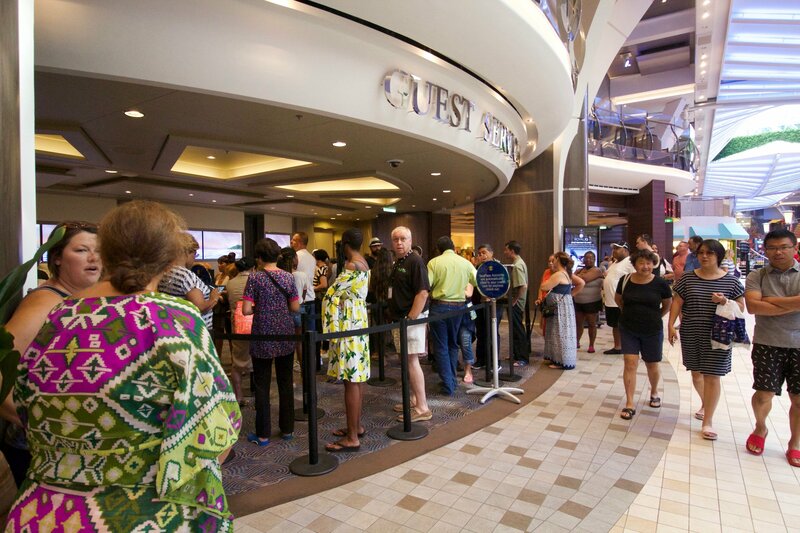 Just walking through the promenade exploring, I noticed the guest services desk was extremely long. 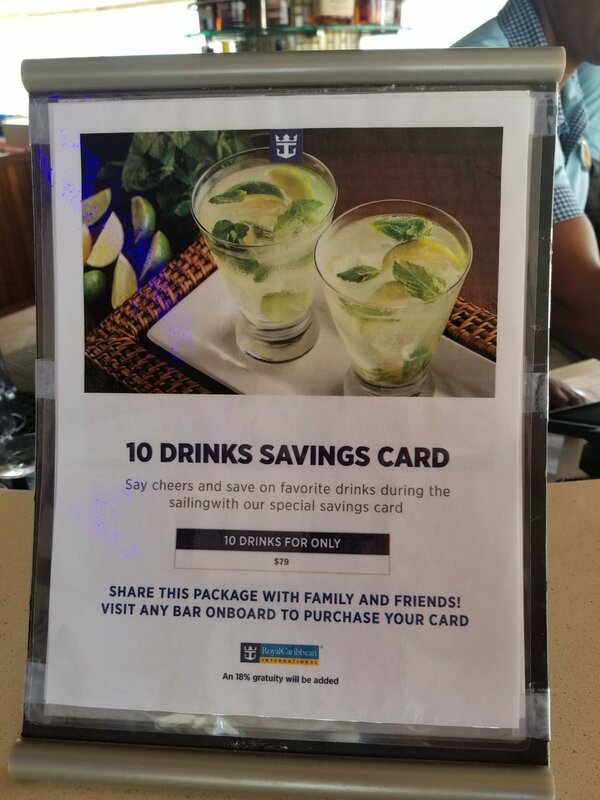 I had looked on my on board account and saw a bar charge for some drinks. Not a big deal, they took them off since I have the drink package, but you want to make sure you double check. Also, noticed the drinks you order with the package show up for $0.00 and kind of scary to see that after a week. One of my friends was staying in a loft suite and invited some of us up to the suite area. This is a private area restricted to Star, Sky, and Pinnacle Club members only. They had a private hot tub up here beside their bar. 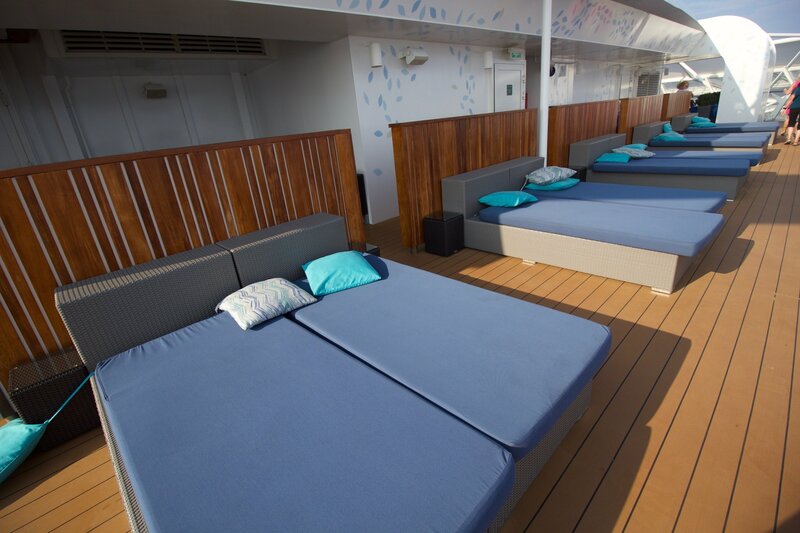 While walking around on the suite deck I came across four cabana’s looking over the Solarium. 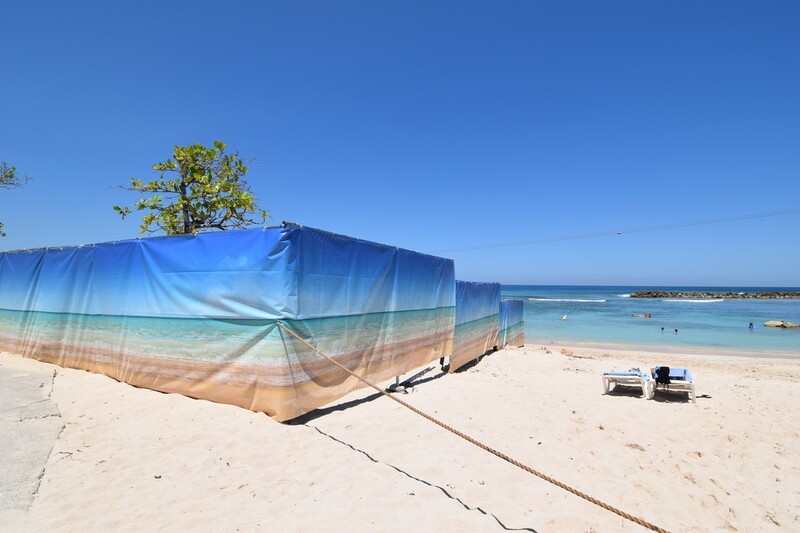 These cabanas would be my go to spot and come at no cost. 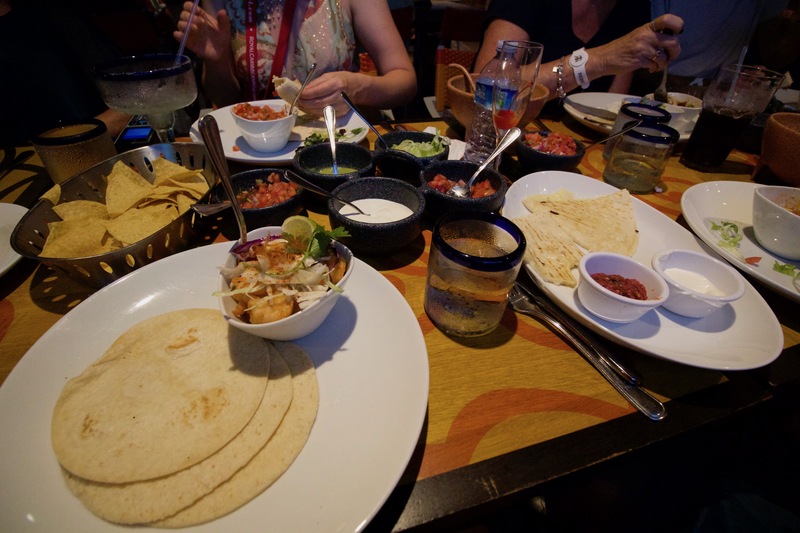 Tonight I had planned a dinner at Sabor for anyone who wanted to come in the group. 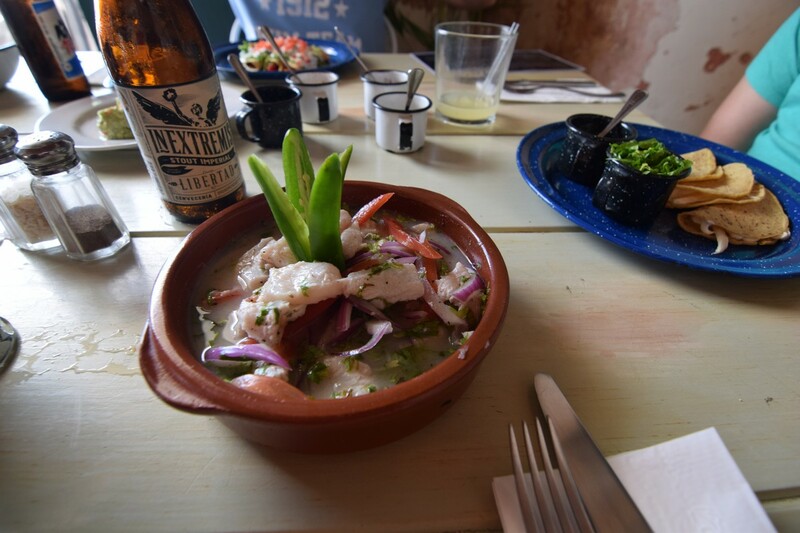 I reached out to the Sabor manager early in the week to let them know we would need reservations for 25 guests. 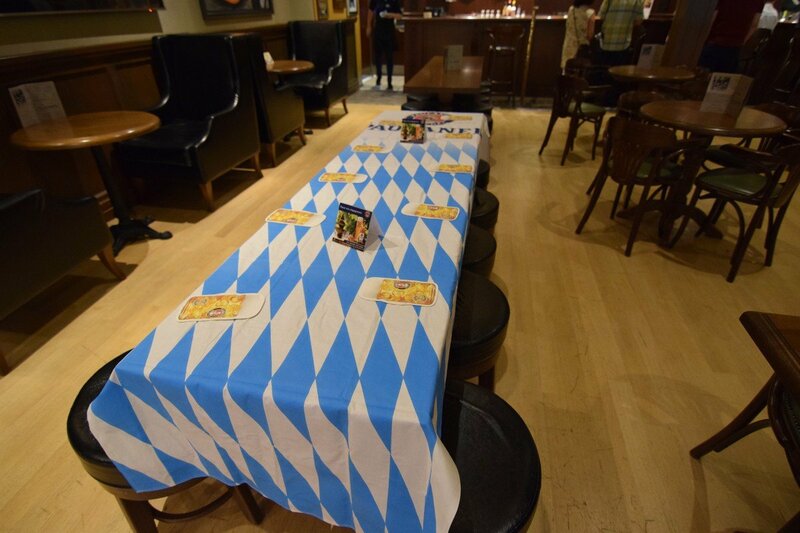 They gave us two large tables and we all had a great time. 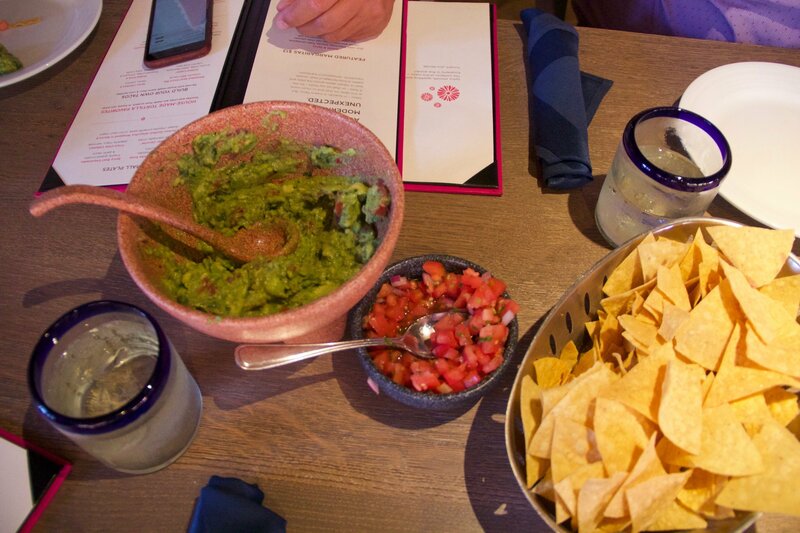 I know what you must be thinking; didn’t you already eat Sabor once today? 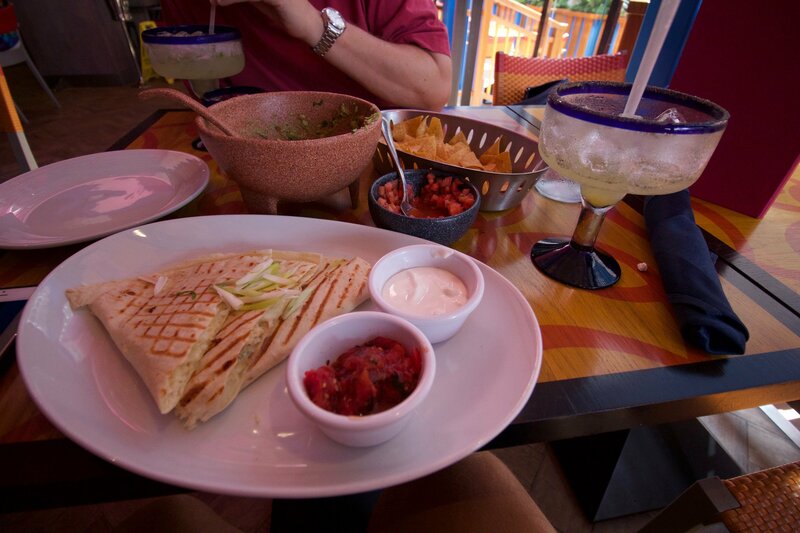 It’s like there is no such thing as too much Mexican food. 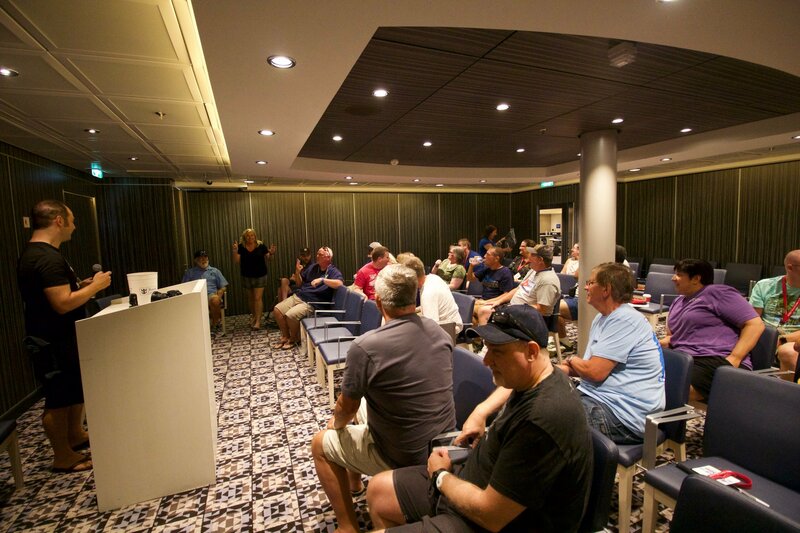 We had a really fun time all together and recapping the week cruising together. After dinner everyone in the group met at the pub for our goodbyes. This was a really sad to say farewell to everyone, but I’m glad Matt arranged this to see everyone. At 11:30pm I decided to call it a night because my flight was at 8:30am Saturday morning. Almost everyone told me not to book this flight so early, but I really thought I could make it work. To report back on my experience I wanted to document every step of the way, so I made sure to capture the time. I went downstairs to express departure line at 5:45am. We were cleared and ready to walk off at 6:22am. The customs lines were moving fast, so I was through that by 6:31am. 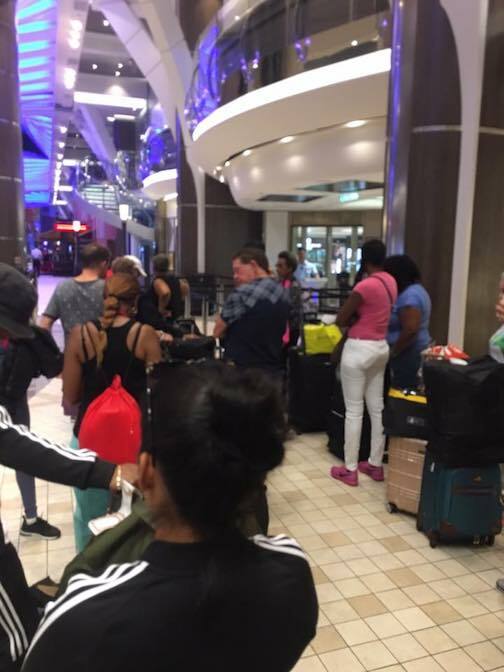 I jumped in a taxi right there at the port for $12, and arrived to Ft. Lauderdale Airport at 6:39am. I made it through security and walked up to my gate at 6:53am. So I made my flight and was home while some of my friends were still on board. I don’t recommend trying a flight this early, if you have other options. I think we all know, this was extremely high risk that everything must go perfect to make this flight. Well this is the end to my live blog; it was a lot fun sharing the week with you. I hope you enjoyed both of the blogs at the same time, for two different experiences from the same ship. 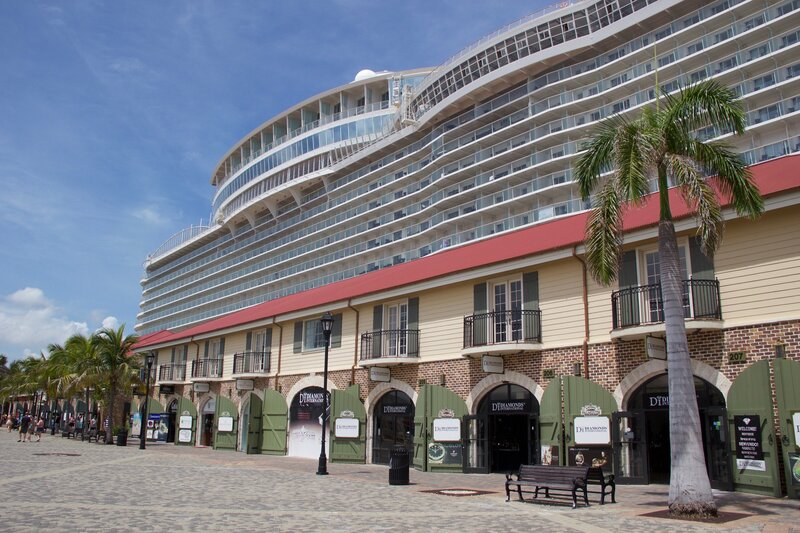 See you in three weeks for my next live blog on Enchantment of the Seas! 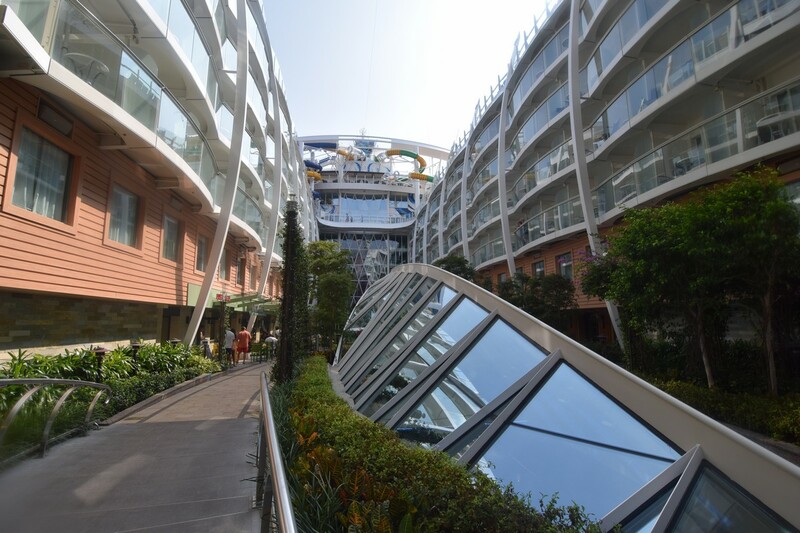 It is hard to imagine but this is the last day of our Harmony of the Seas cruise adventure. It has been such a fun experience, and it all went by far too quickly. We had a late night last night, so we slept in until about 9:30am. It pains me to not take advantage of every minute of the last day, but then again, I need sleep! 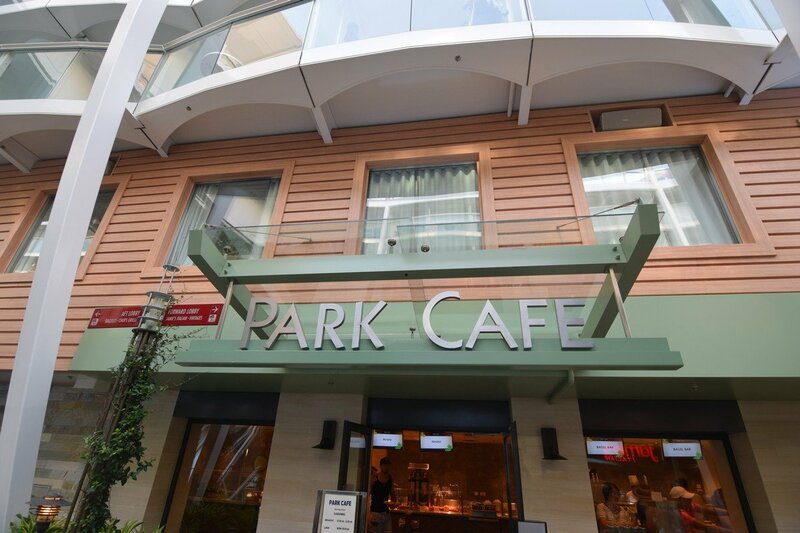 We enjoyed breakfast at Park Cafe. Despite the fact the Windjammer is just one deck below our stateroom, I find the options better in Park Cafe and it is certainly quick. Plus, they have the vegetable sandwich that I really enjoy. After breakfast it was time for our live podcast recording, where those in the group cruise joined me to record an episode of the Royal Caribbean Blog Podcast. 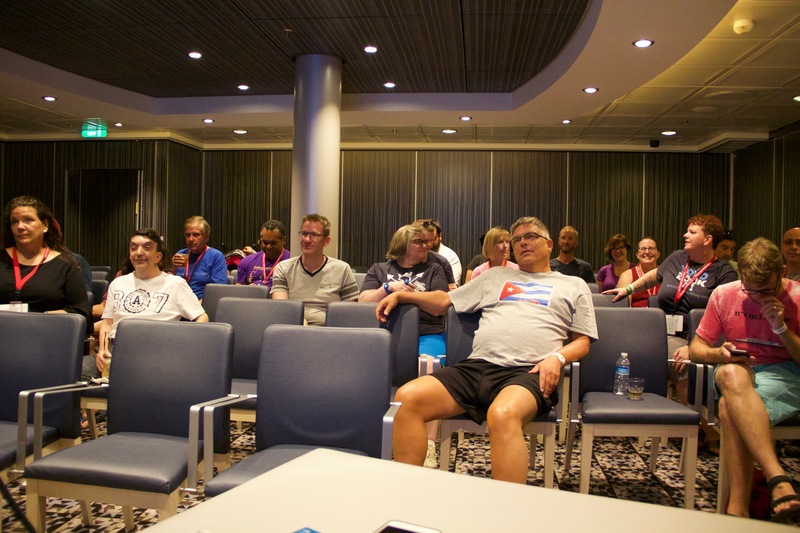 It was great talking about what we did and really enjoyed during our cruise. 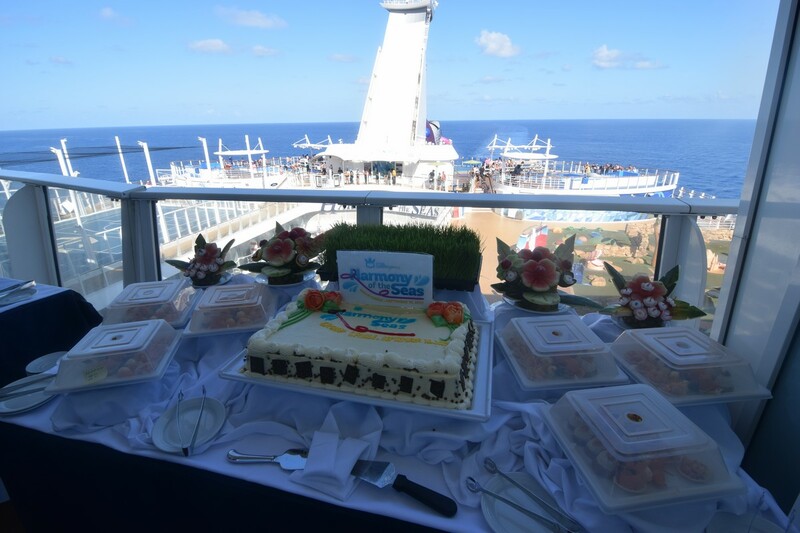 Plus we had a few giveaways and leftover cake from the suite party! 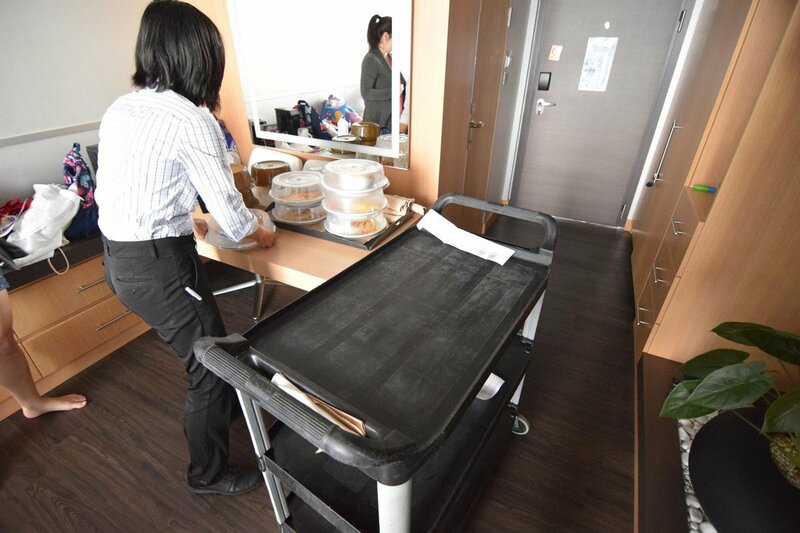 For lunch, we decided to take advantage of our suite perks and order room service to the suite. 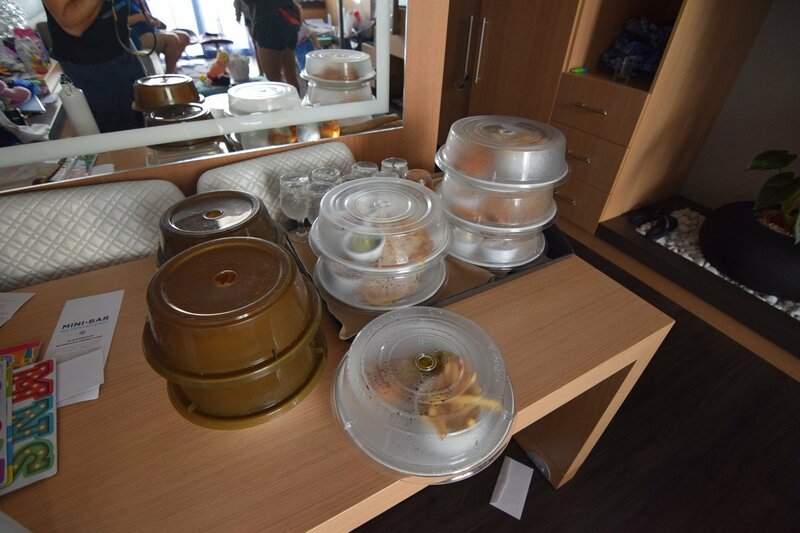 We ordered lunch via the television and it arrived perhaps 30 minutes later. I had the chicken noodle soup and quesadilla. The pico de gallo was really good! My wife went to see Grease in the theater, while I grabbed a drink at the Pub for a bit. I then took the kids from Adventure Ocean and we went back to the stateroom to relax and start packing. In the evening, we rounded out our last night much like every other night. I took the kids up to the Windjammer for dinner before dropping them off in Adventure Ocean. 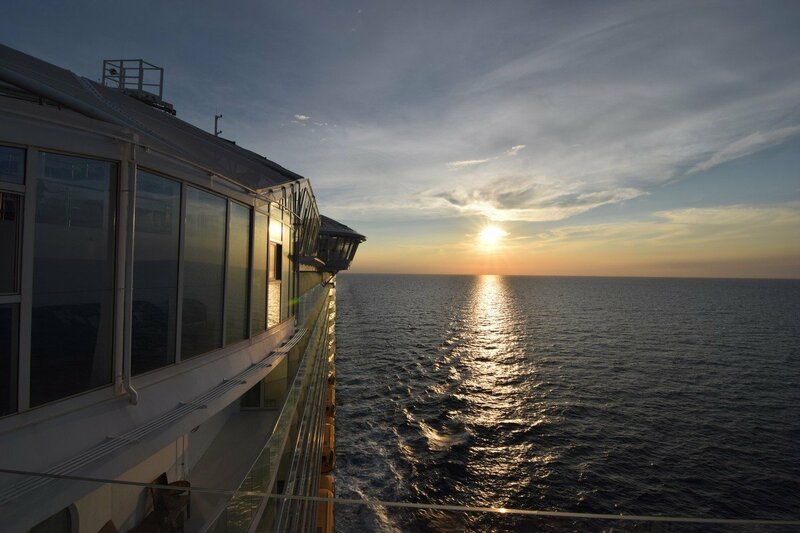 We got to enjoy one final sunset at sea, which was absolutely beautiful. 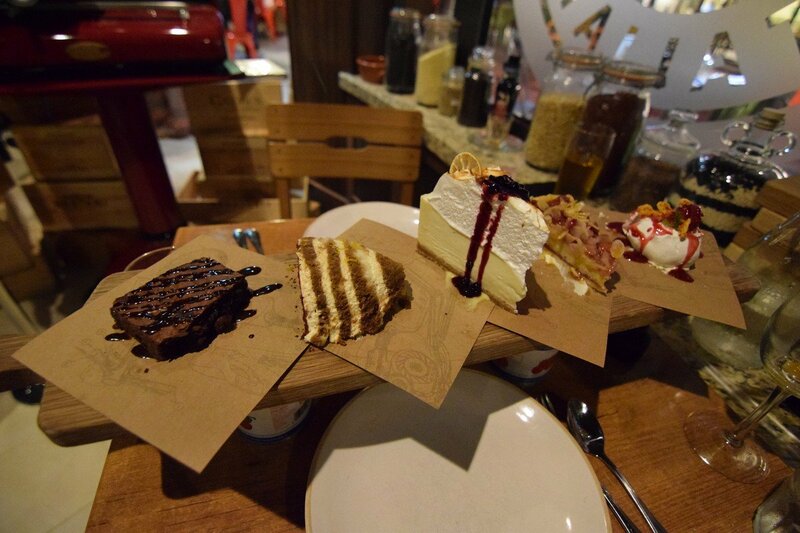 Dinner this evening was in Jamie's Italian because we really enjoyed it so much earlier in the cruise. Plus, my wife loves the Elderflower Spritz cocktail so much. We even sat at one of the outdoor tables because there was enough of a breeze to make things quite comfortable. I tried the chicken cacciatore this time, and it was pretty good! Perhaps not my favorite item, but I did enjoy it quite a bit! Our final activity of the evening was one last get-together among the Royal Caribbean Blog group cruise friends in the Pub on the Royal Promenade. It was a great way to see each other one last time to wish goodbyes and figure out the next time we would all see each other again. 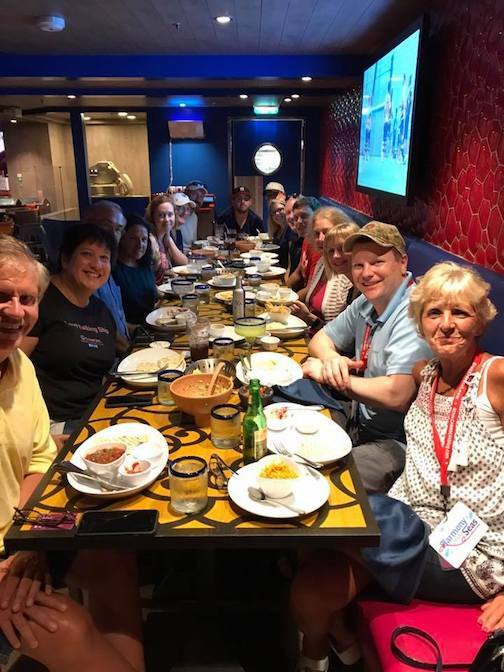 Without a doubt, this group cruise was a tremendous success, both in terms of having another great Royal Caribbean cruise vacation and putting together a fun week-long trip among friends. I am so grateful to the nearly 100 readers who joined me on this sailing, and for the incredible memories we were able to share together. 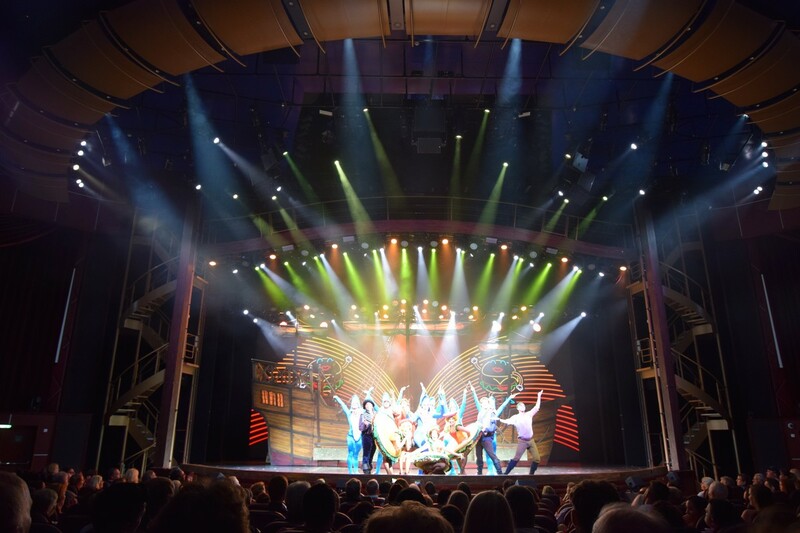 In addition, my family had a great cruise vacation along the way and we will return home with many more memories that we will talk about for many years to come. In retrospect, I am glad we upgraded to the Crown Loft balcony suite. 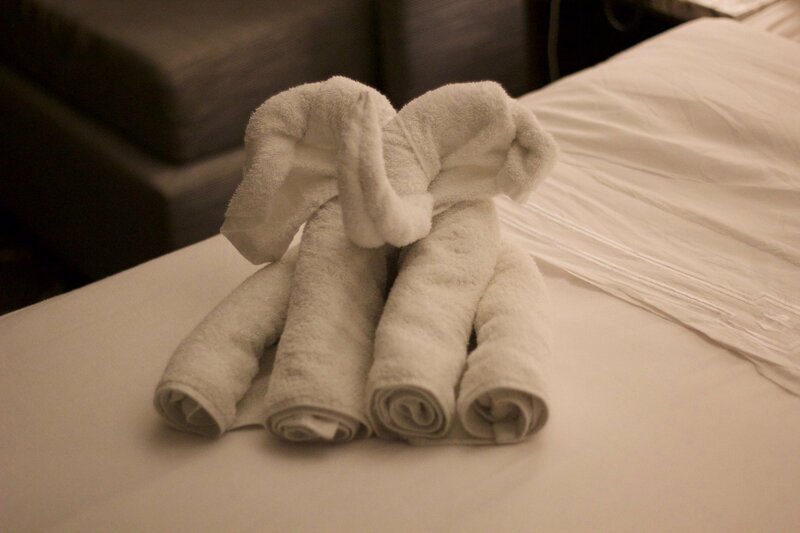 The room configuration and benefits added so much to our vacation experience. Aside from price, I would not hesitate to recommend or stay in this kind of room again. 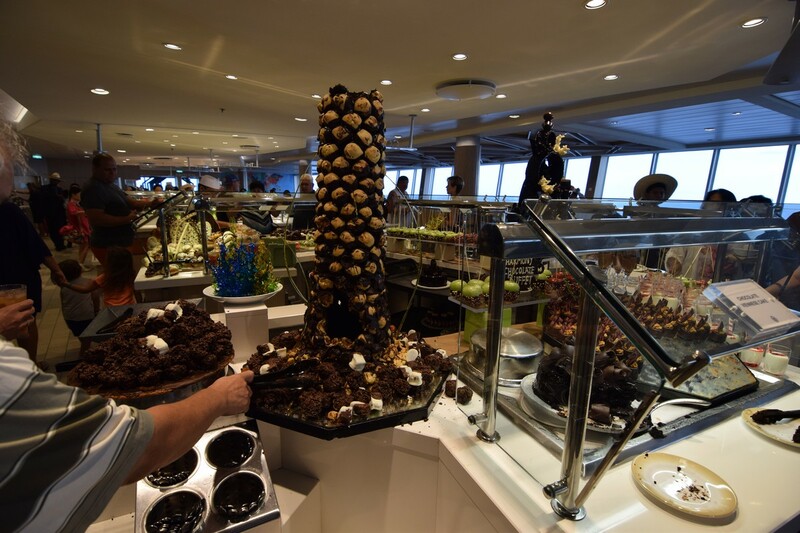 Moreover, Harmony of the Seas remains my favorite Royal Caribbean cruise ship because of the wealth of activities, dining choices, events, and more. 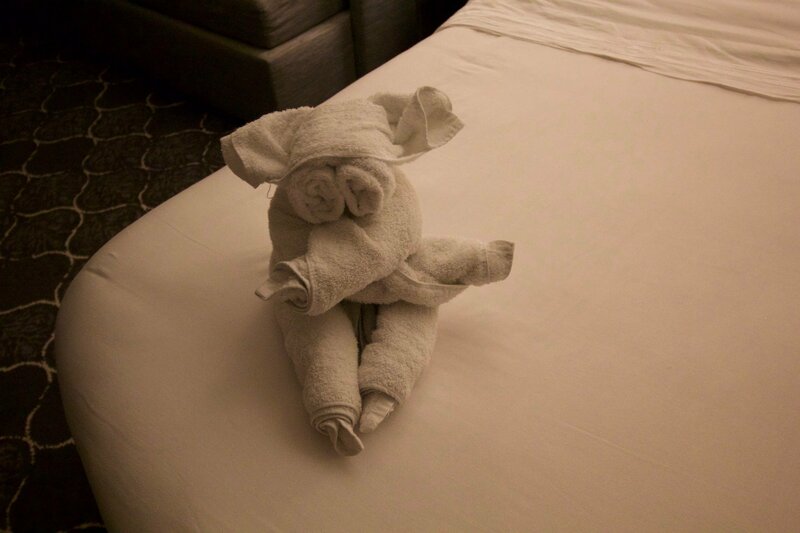 The staff was incredible, including perhaps the best stateroom attendant we have had in many years. Thank you to everyone for following along the fun in this live blog. 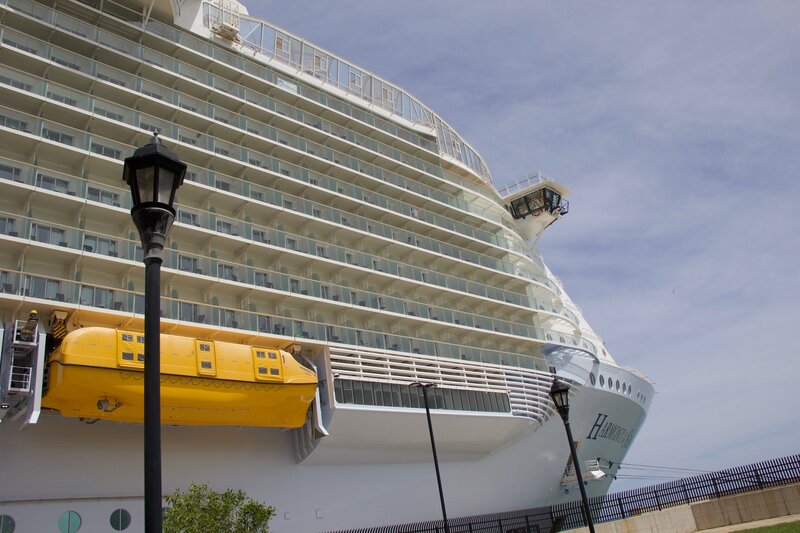 I enjoy sharing the cruise adventure with all of you, and I relished in reading your feedback every day of the sailing. 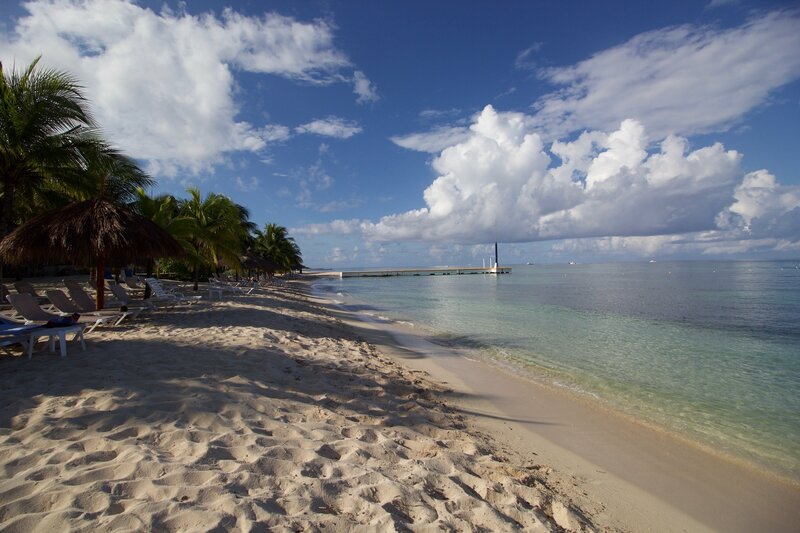 Today was our last port of call in Cozumel, Mexico. We arrived at 8am and staying until 7pm, so we have a full day in Mexico. 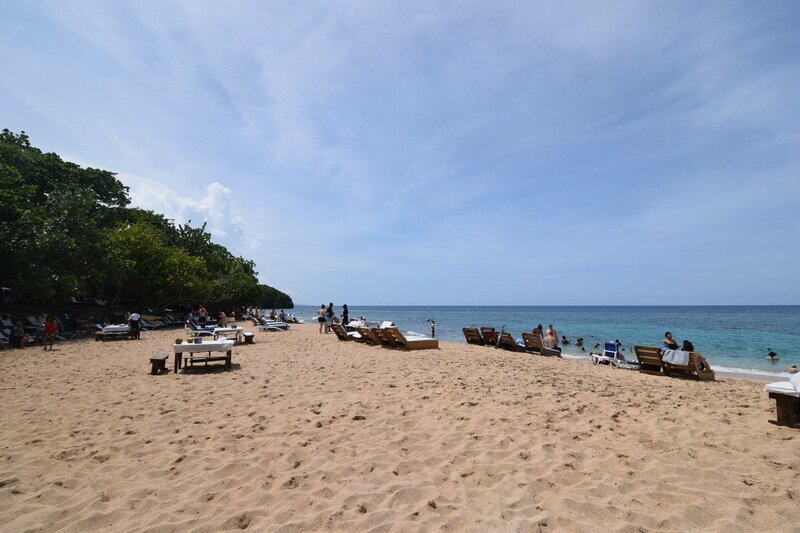 I had booked a beach day at Nachi-Cocom for $55. 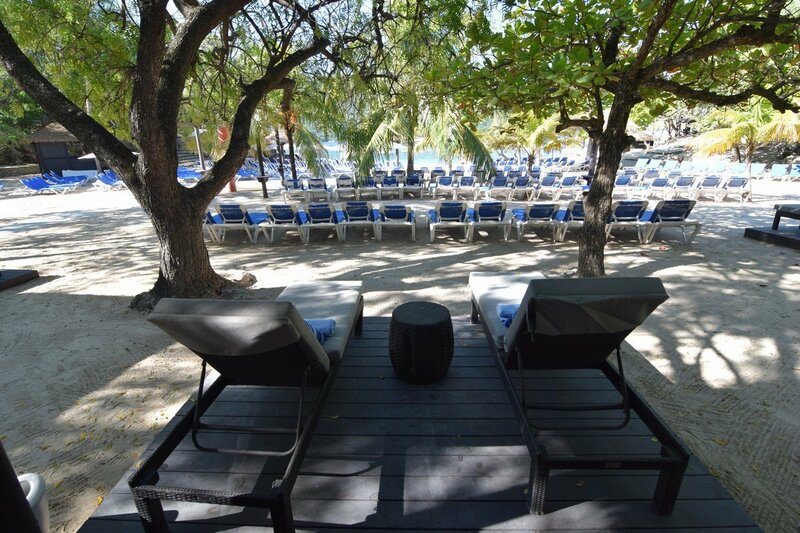 This is an all-inclusive beach venue, and when you make reservations online you pre-pay $11 at booking. 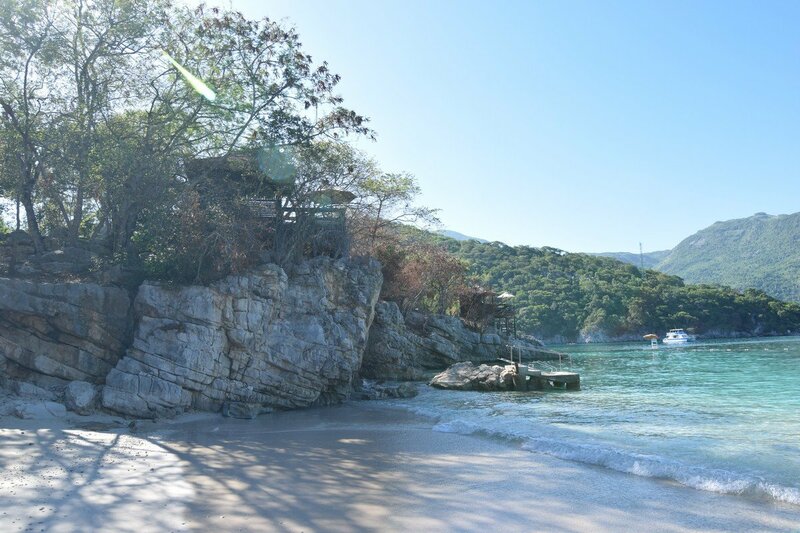 I’ve been coming to Nachi for many years now; it’s almost time to explore some other options in Mexico. We had four Carnival ships, one NCL, & one Royal in port today. Needless to say, the port itself was packed. They did have the taxi line very organized; our ride was $17 (up to four people). Nachi-Cocom was way over booked, today with around 150 guests. I talked to the staff there, about why they had more guests than usual. They mentioned because ships keep changing their schedule and guest who have booked for other date are being honored. 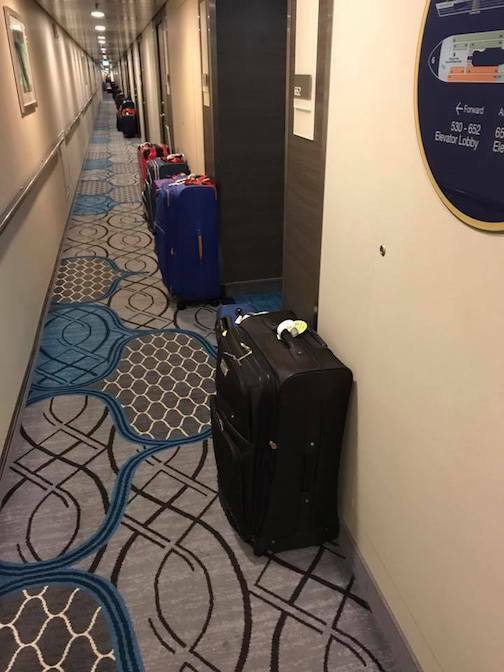 They are trying to take care of those guests who booked, but it seemed a little overran today. There was about twenty of us in the group cruise that booked Nachi today. I really enjoyed being able to spend the day with them. At 4:30pm we started to wrap up and make our trip back to the ship. The staff at Nachi calls a taxi for you and they arrive in a matter of minutes. 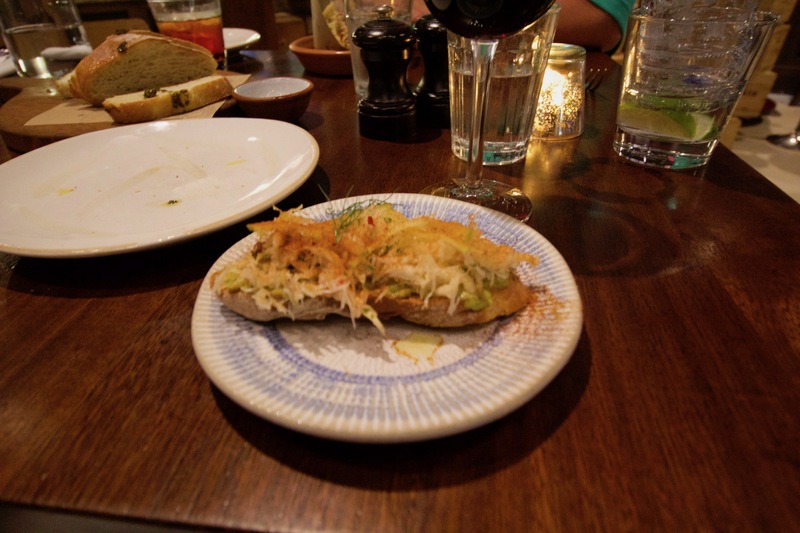 Dinner tonight was at Jamie’s Italian at 7:30pm. I mentioned that I didn’t love the meal here night one, so I wanted to try it again. I made our reservations about two hours prior to our dining time. I left night six open so we could decide later in the week what we wanted to eat again. We didn’t order the large meat try since we found out, that’s a meal in itself! 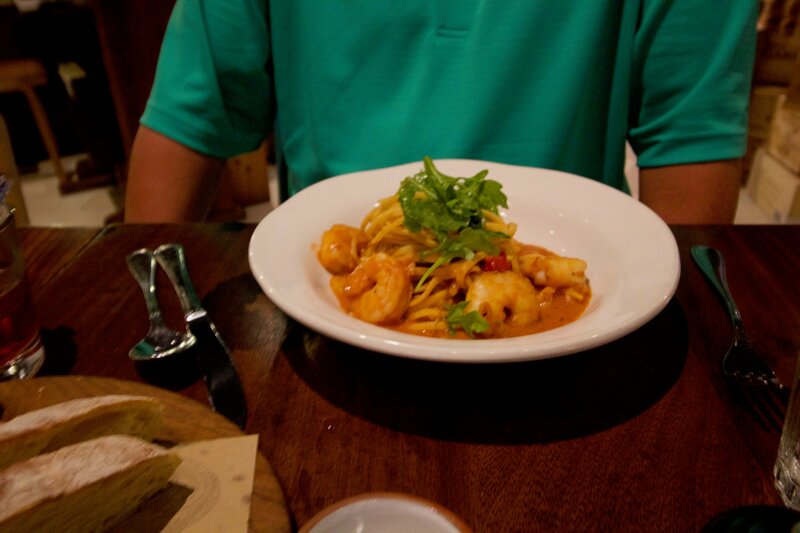 We had a lite starter and some pasta for the main course. I was really pleased with the meal, and a fan of Jamie’s now. Tonight was the Quest adult game show in Studio B. They had battle of the sexes in the same venue right before, so getting seats together was a little struggle. I played as our team captain, and sad to report, we got second place. The game was so much fun, and I think a lot of my friends got some funny pictures of me dressed up. Well tomorrow is our last sea day, as we head back to Florida. 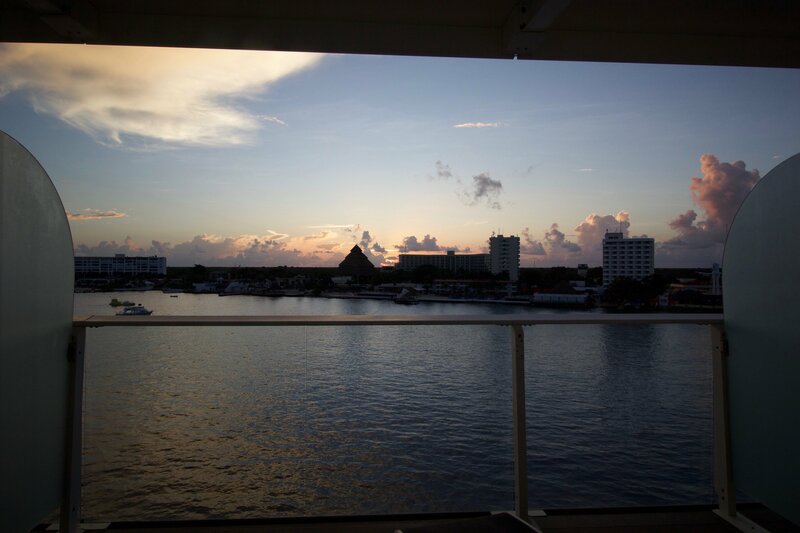 Our final port stop brings us to Cozumel, Mexico and we intended to finish with a great day in town. 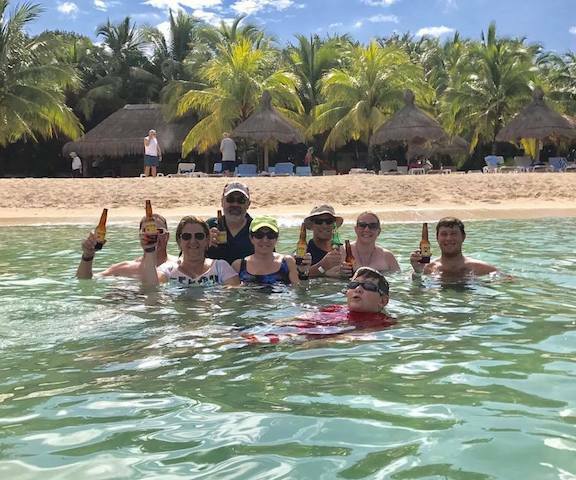 We fed the children at Park Cafe and dropped them off at Adventure Ocean so they could enjoy a fun day with their friends while my wife and I explored Cozumel on our own. We got off the ship and took a taxi downtown to start things off with a massage for my wife at a local masseuse. While my wife enjoyed her massage, I found solace in Starbucks, which had the air conditioning flowing on a very hot and humid day. 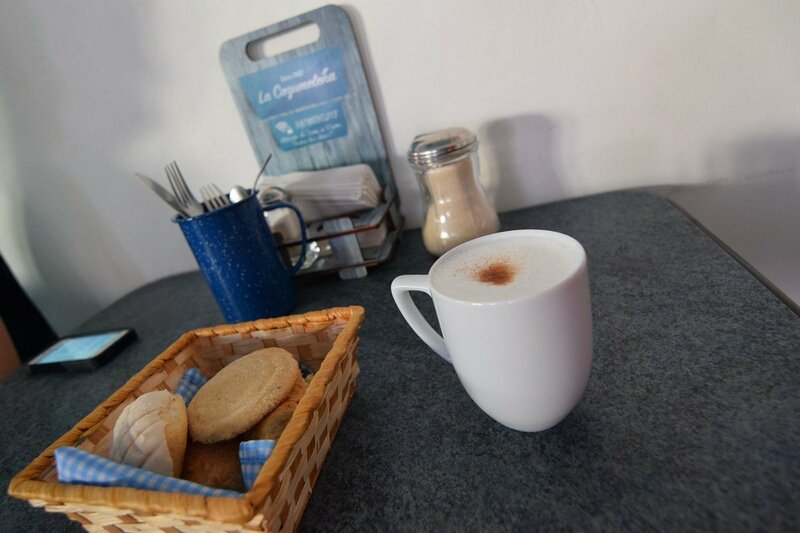 I picked my wife up and we stumbled upon a great little coffee house to take a quick break while friends joined us for lunch. 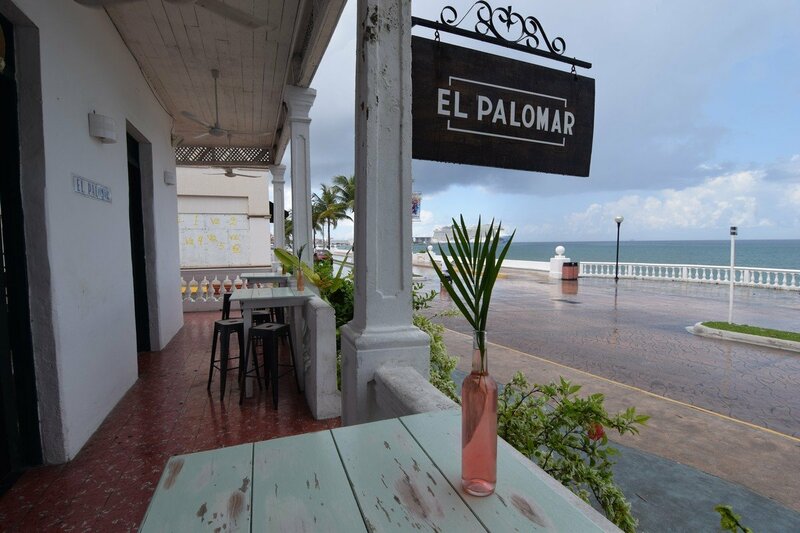 We grabbed lunch at a place my friend from CruiseHabit.com recommended, El Palomar. 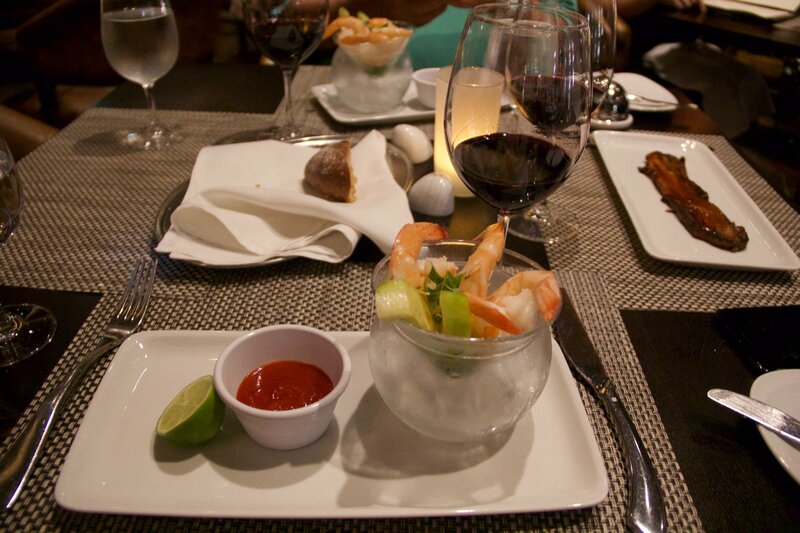 El Palomar serves freshly made Mexican food that blends traditional with modern touches. 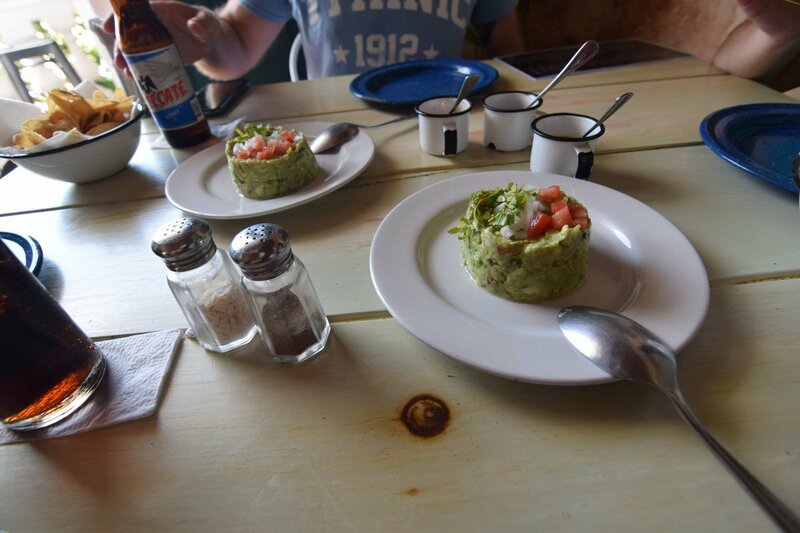 Great food all around, including the all important guacamole. We did a little shopping after lunch and then headed back to the ship. 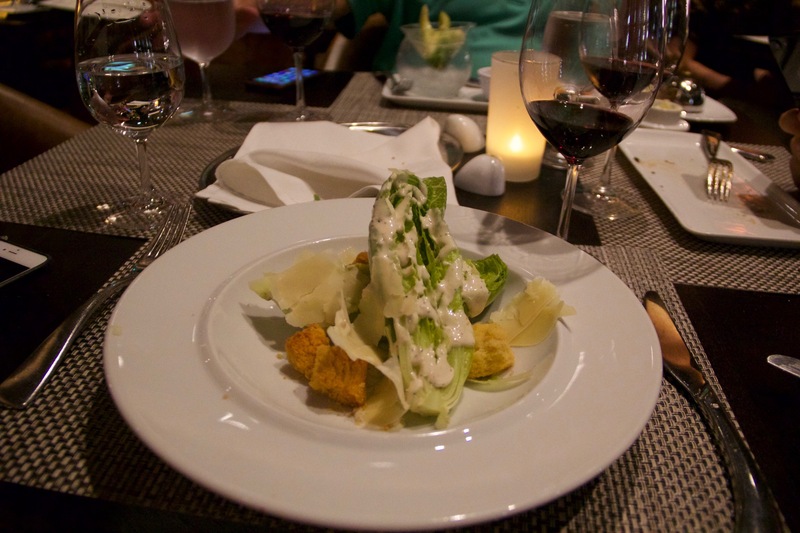 After an afternoon of resting back in the ship, we enjoyed dinner at 150 Central Park. 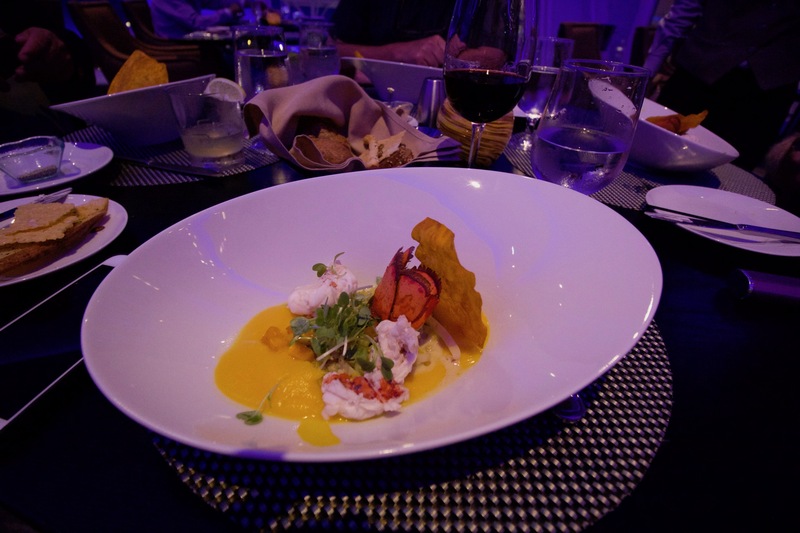 On our last cruise on Harmony of the Seas, 150 Central Park had been my favorite specialty restaurant and I was excited to try it again. 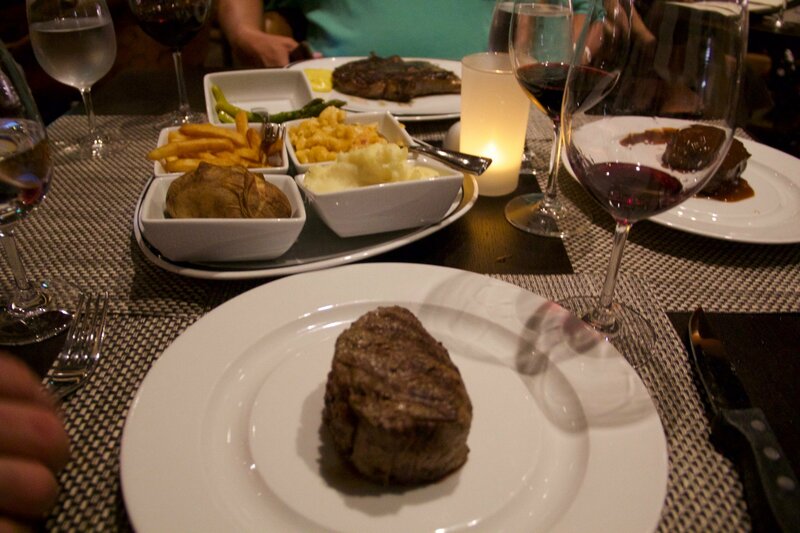 I am happy to say it did not disappoint and the steak for two was terrific. Following dinner, we got to see Columbus, the Musical again. My wife and I really enjoy the show and decided to check it out once again. Most of us in the group went to see The Quest in Studio B. 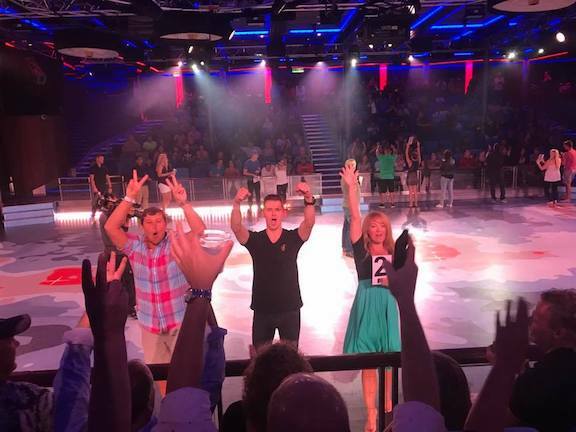 Our RoyalCaribbeanBlog team played extremely well, coming out with a second place finish. 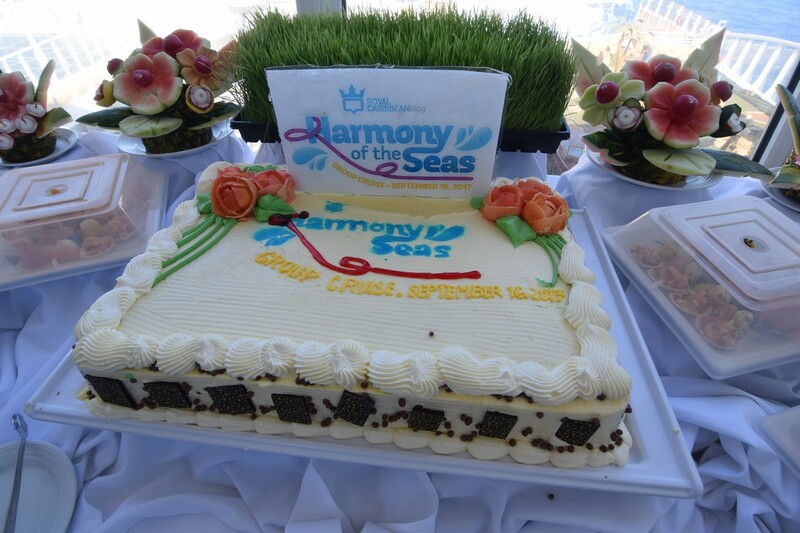 Tomorrow is our final day on Harmony of the Seas and it is sure to be a busy sea day! 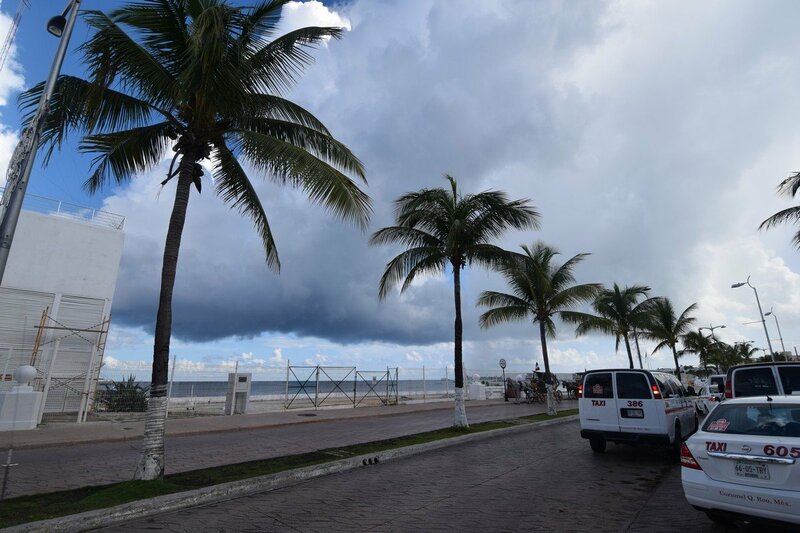 The weather in Cozumel was partly cloudy, but it did rain a few times. Not a rain out, just a break from the clear blue skies we had seen all cruise. 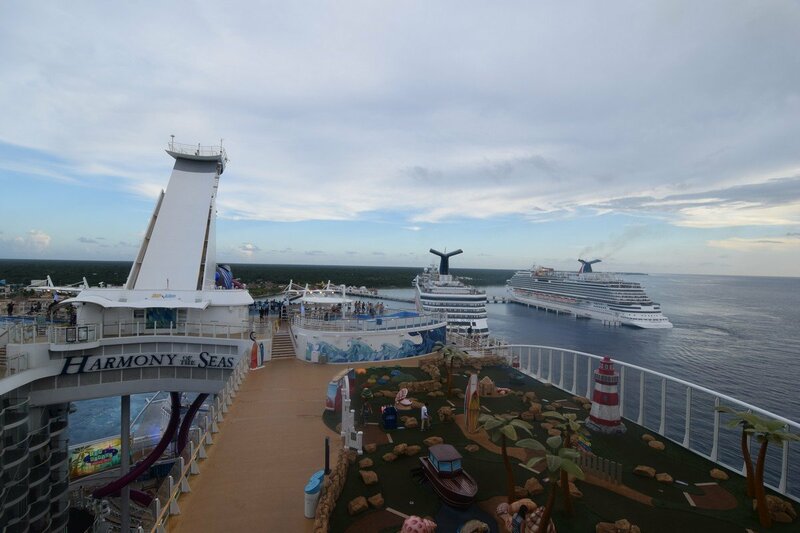 There were 4 different Carnival ships in port with us, plus a Norwegian ship. 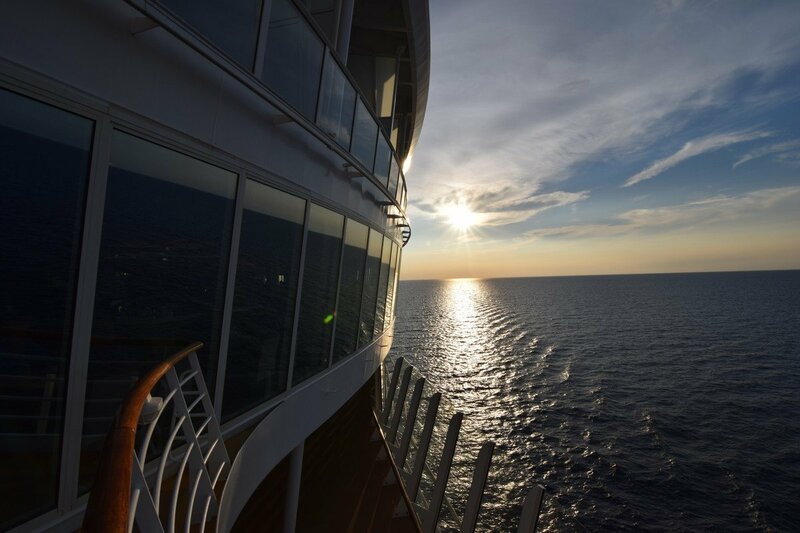 It's hard to believe we are already on day five of this cruise; they always go by so fast. 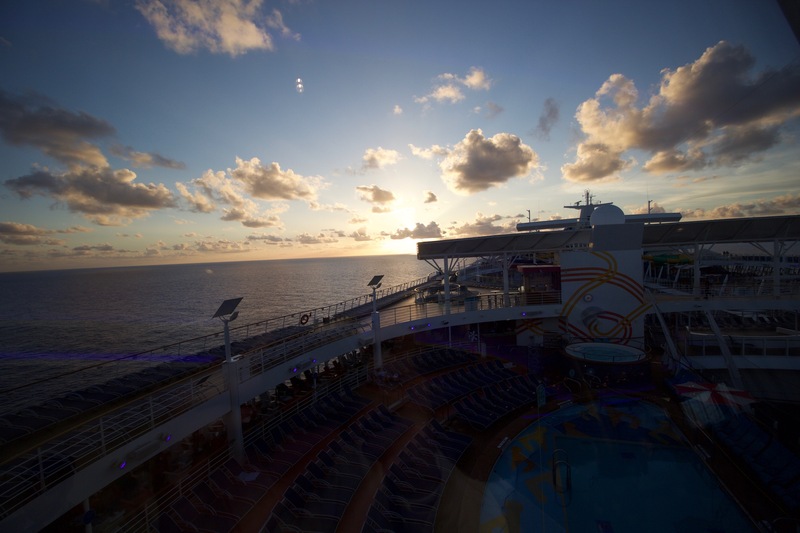 Today we have our second sea day, as we sail to Cozumel, Mexico. I did sleep in until 8am today, since we were up late, but 8am on vacation might be considered early to some. Today was actually a pretty busy day as far as our schedule goes. I didn’t go to the pool today, I needed a break from the sun, so I spent most of the morning down in the Royal Promenade. 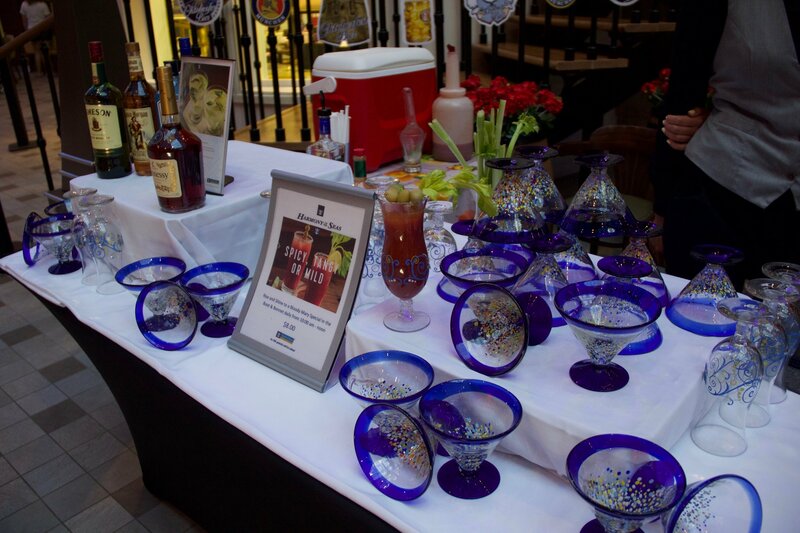 I noticed they had a drink table set up, selling $8 bloody mary’s, not a bad price for on board prices. 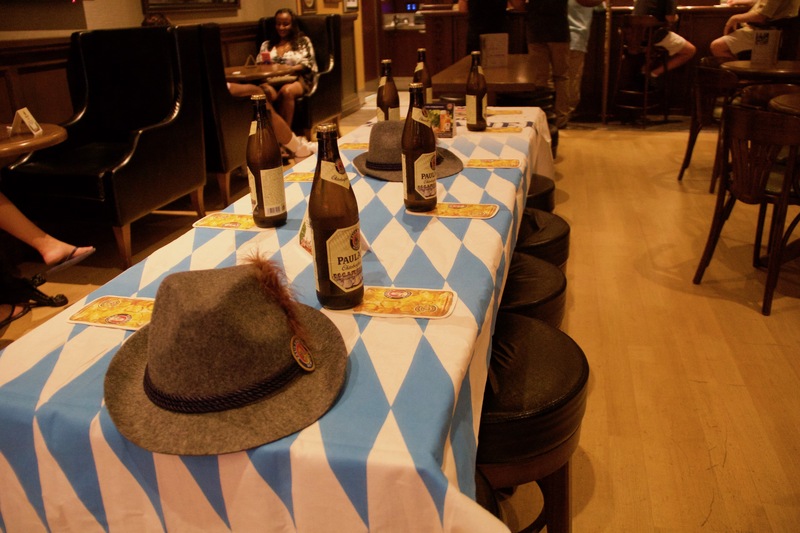 I also saw them setting up for Oktoberfest fest in the pub. They were selling a large pint glass to take home for $18, but it came with a 32oz of beer. Also you could buy the 10 drink draft beers card in here today for $49, which is made for sharing if you like. First event today was lunch at Sabor at noon. 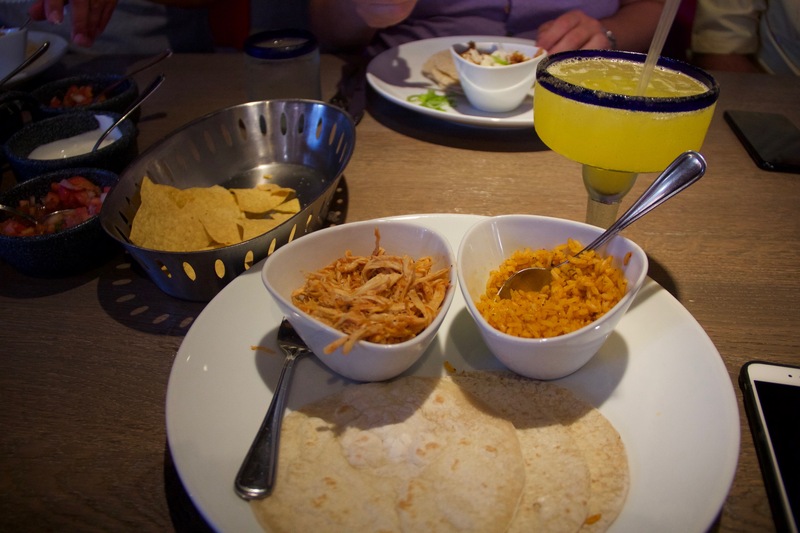 We had the usual margaritas and tacos. 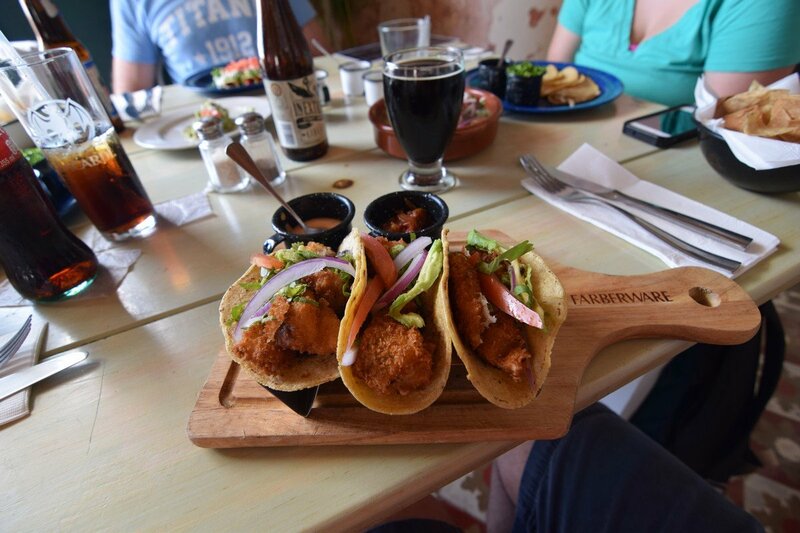 Not much to describe here, other than I like the shrimp taco’s a lot more than the chicken taco’s. The blog group had an official meet-up today down in the conference room, we played a game called Super Password. Matt had asked me to be a panelist for the game, which I agreed to not knowing anything about the game. It’s kind of hard to explain, but you have to guess a word with only sharing one word. I didn’t win, but I sure had a lot of fun playing and meeting up with the group. Our next event today was the loft suite, “sweets party.” We had two loft suites beside each other, and opened up their balcony doors. 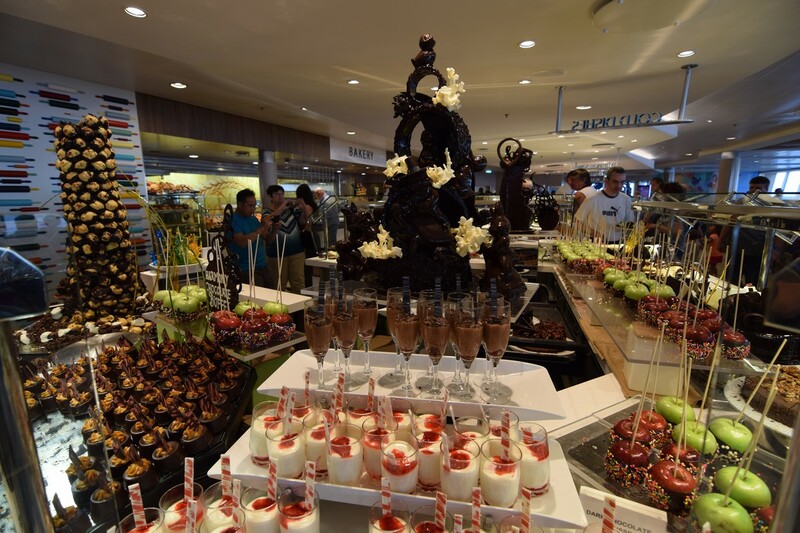 They had food, cakes, and even an open bar for everyone in the group. It was fun to see the loft suites and have pre-dinner in Matt’s cabin. 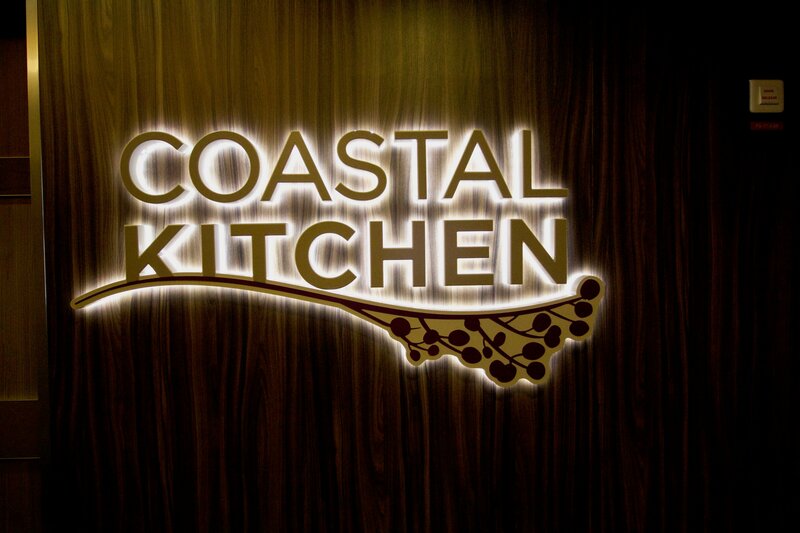 Dinner was in Costal Kitchen tonight; this was my first time dining here all week. 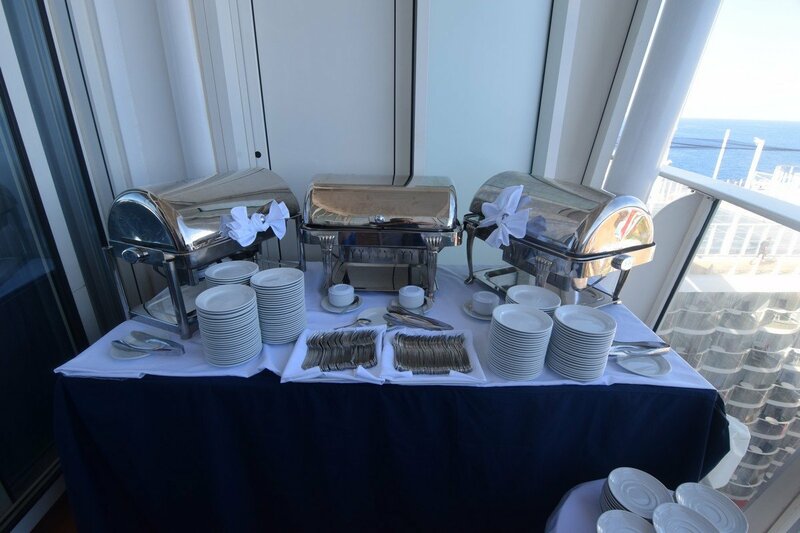 In the Junior Suites you are invited to dine here for dinner only. 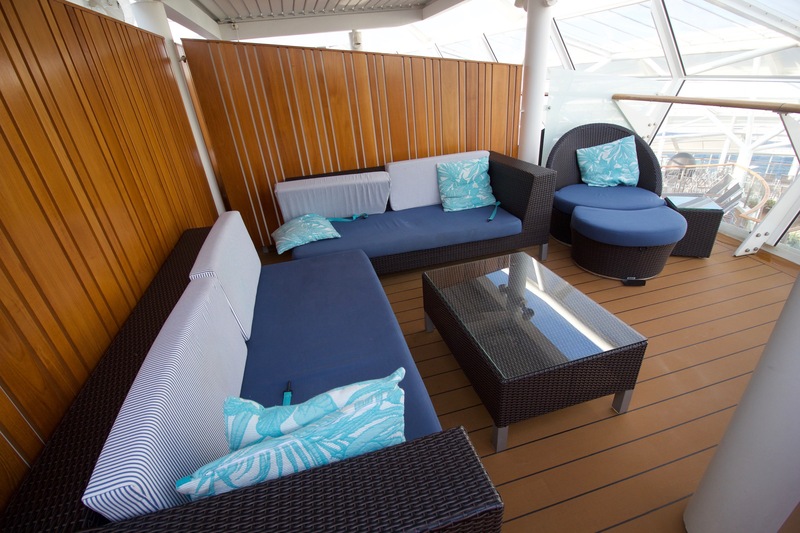 I absolutely, love the views from the suite area, it reminds me of the Viking Lounge on Majesty of the Seas. I was able to watch the sunset, while having a glass of wine at dinner – it was perfect! The service was outstanding; I never asked for another drink, they just brought them. 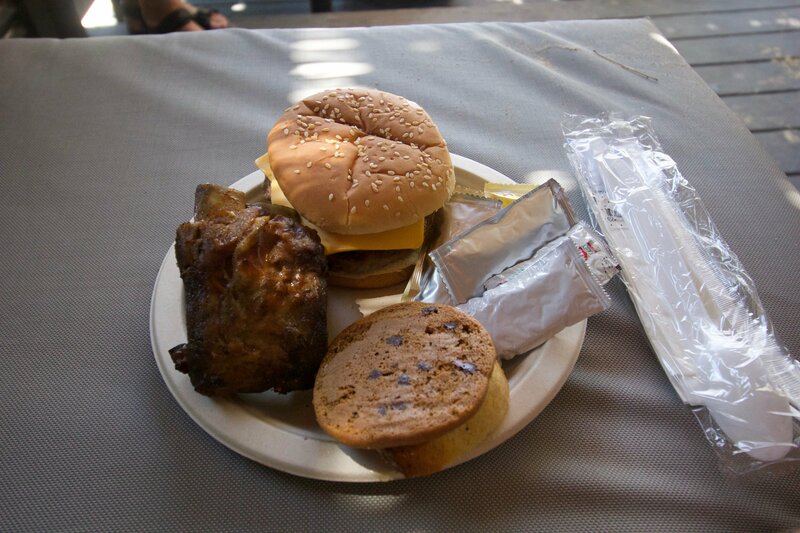 The food was also great, I enjoyed the smaller amounts of food since we have been eating so much. Tonight was the 90’s street party in the Royal Promenade. 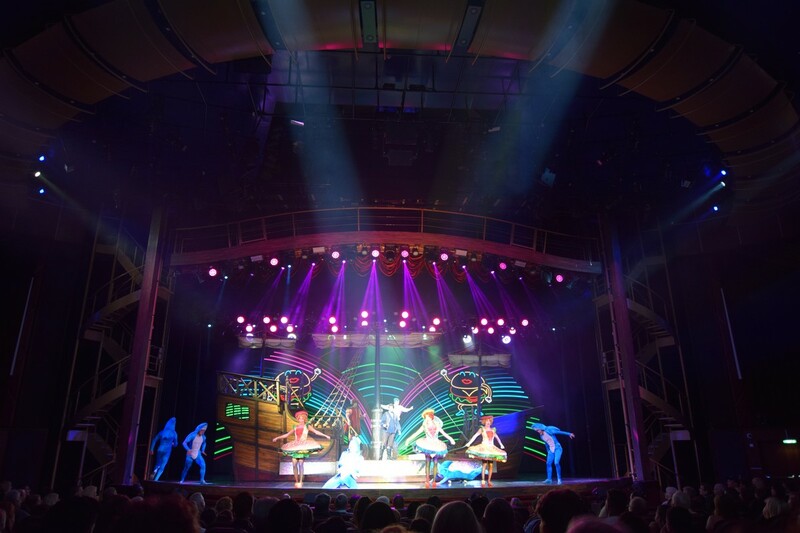 This is a brand new show that’s only on Harmony of the Seas. Her sister ships have the 70’s street party, so they are trying to progress a few decades for the younger generations. I enjoyed the show and seeing something totally different than I’ve seen before. However, I did miss the Columbus the musical show, since they were both at 11pm. After the street party, I hung out in the pub for a few hours with our group. The music stopped kind of early, but we stayed and had our own fun. 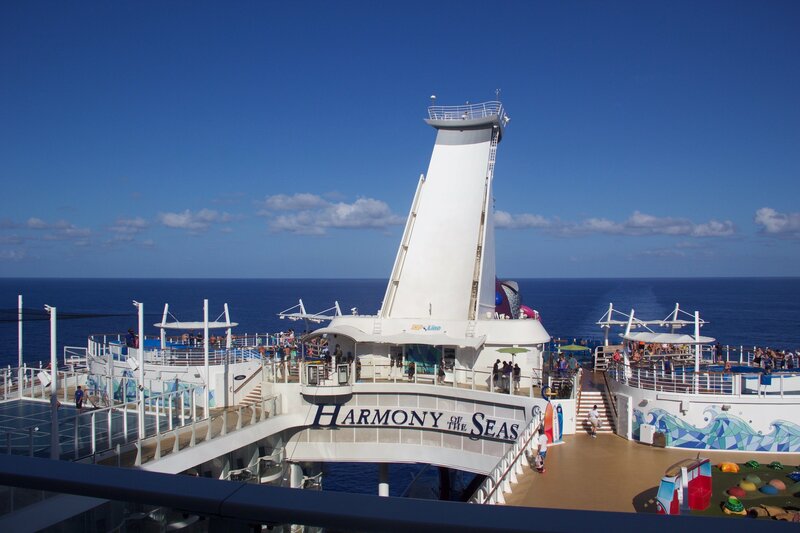 Well that’s my full day on board Harmony; tomorrow we are in our last port Cozumel, Mexico. I really enjoy having alernating sea days and port days on my cruise, and after two port days we had another sea day to enjoy. We let the kids be our alarm clock and decided to grab breakfast in Johnny Rockets. 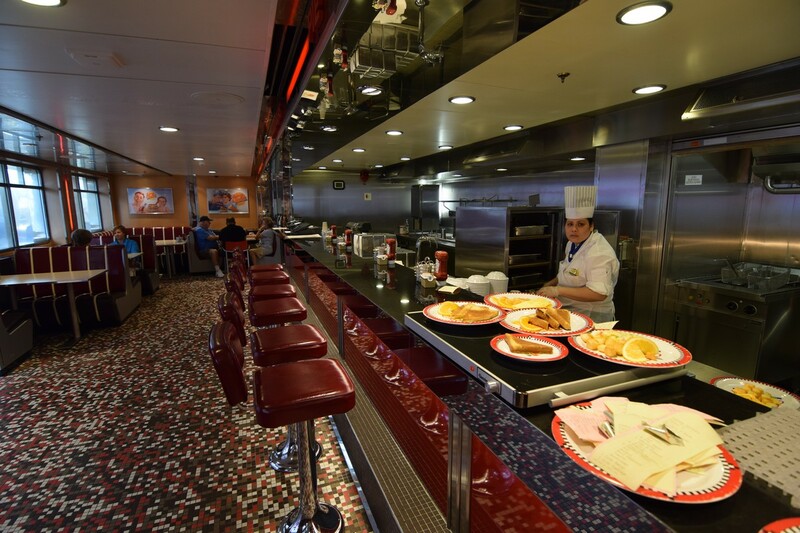 On Oasis class ships, Johnny Rockets is complimentary for breakfast. I also stopped by Starbucks to grab a Pumpkin Spice Latte. 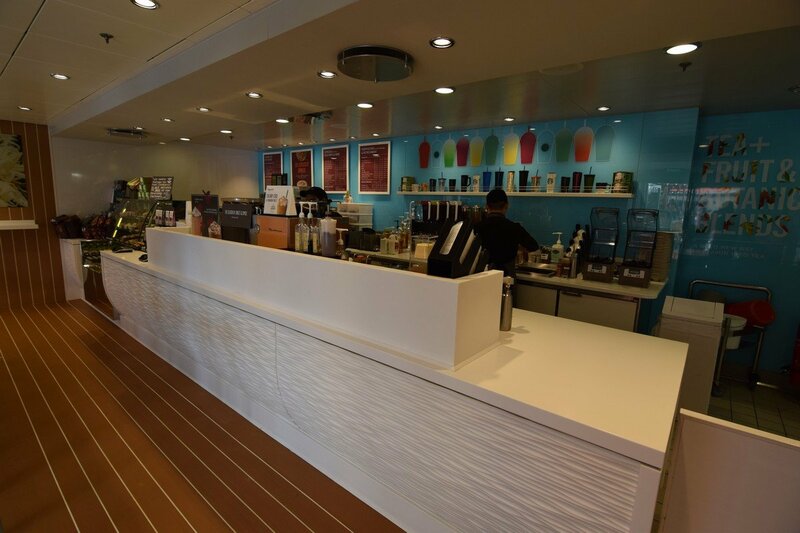 Gotta love having Starbucks onboard! 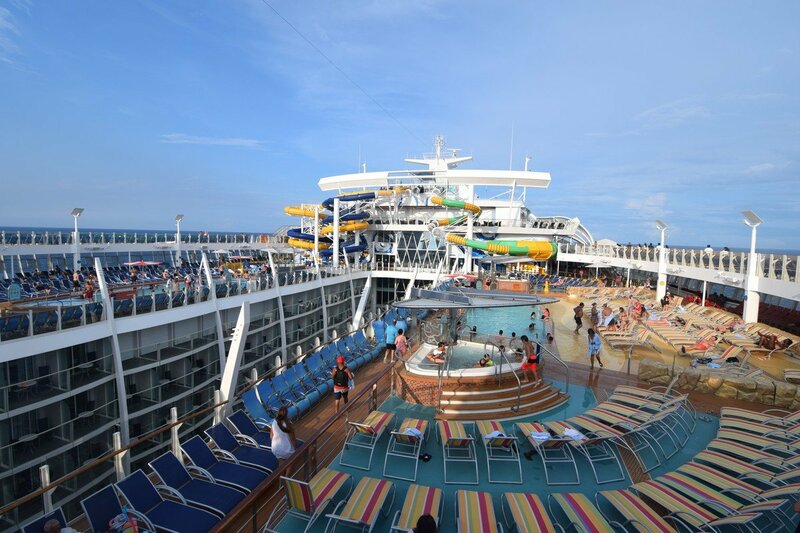 The kids had some pool time on another beautiful day at sea. After lunch we held a Royal Caribbean version of the classic game show Super Password. 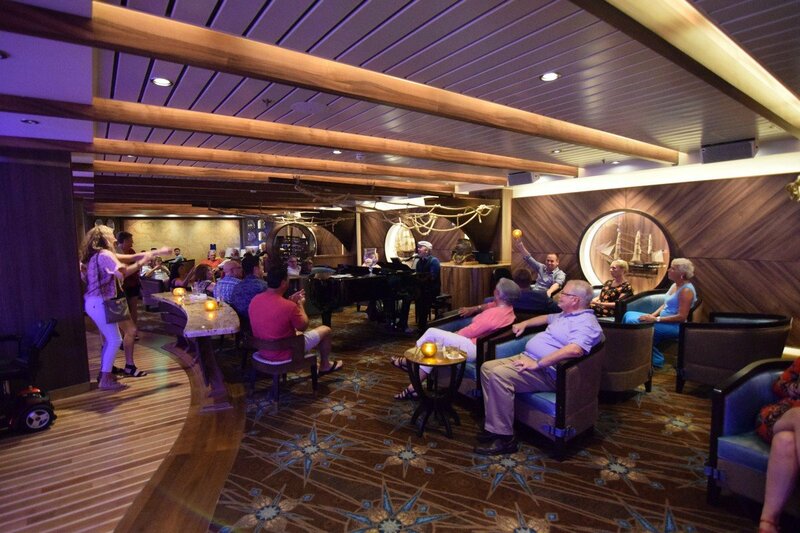 This was an event we put together for the folks on the group cruise, and I think it was a lot of fun for all who attended. 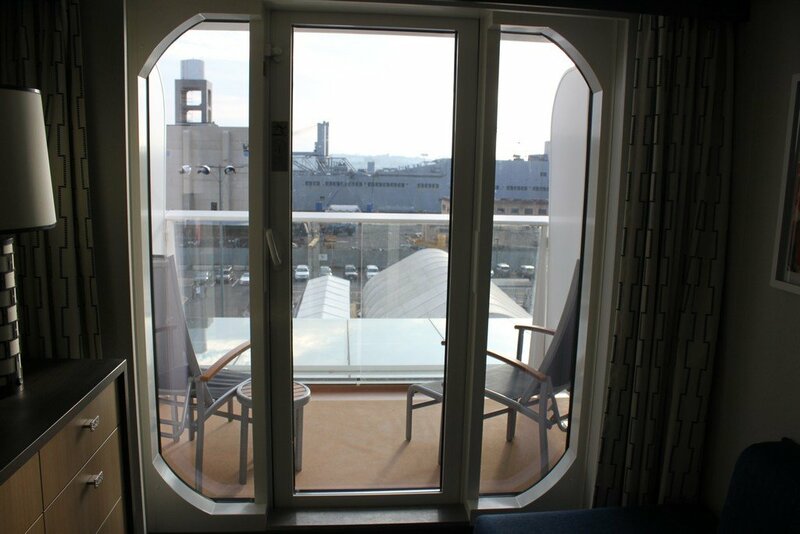 This afternoon, we hosted a party in the suite between my stateroom and my friend Rich's room next door. 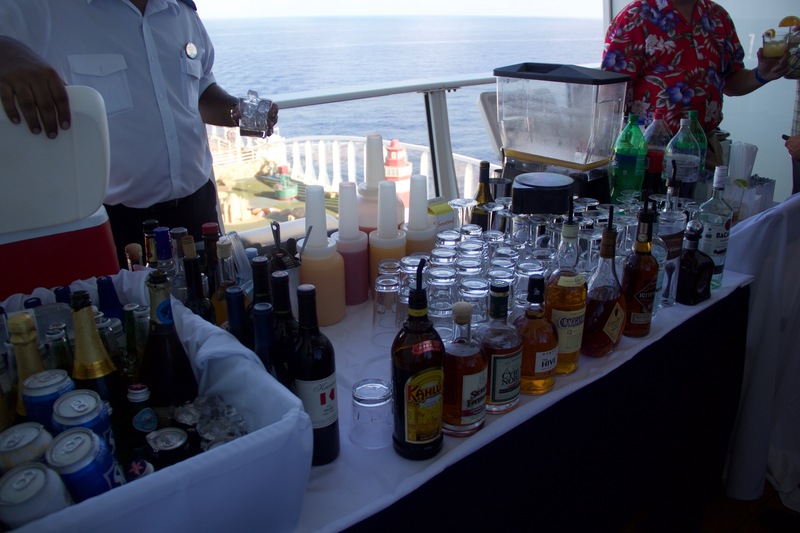 We opened the balcony divider and had a catered meal, complete with open bar for folks in the group cruise. It was something I had never done before, and a great opportunity to chat and hang out. 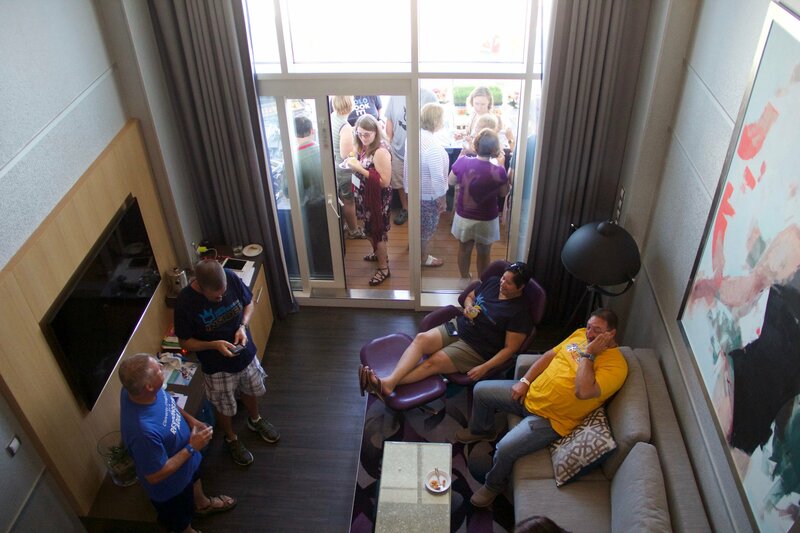 Plus, for many folks, they got to check out the Crown Loft suite accomodations. 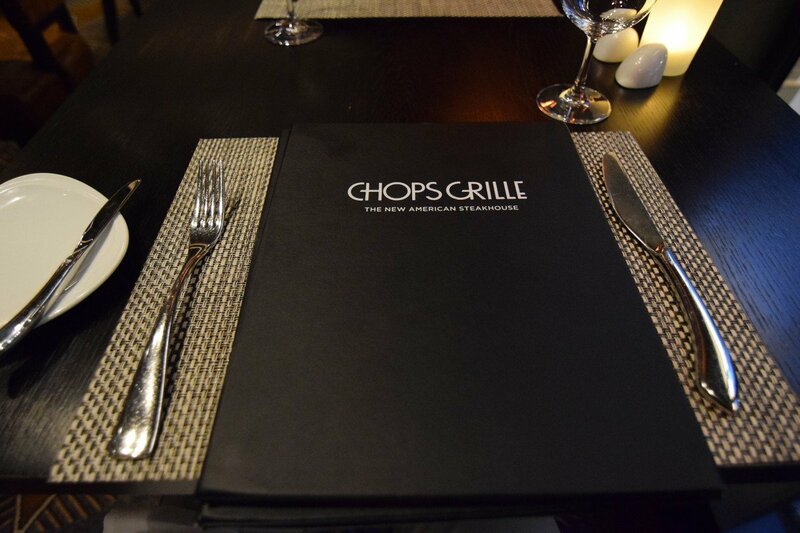 Dinner this evening was in Chops Grille. My wife loves dining there, and since it was our anniversary, I had no choice but to book it for her. 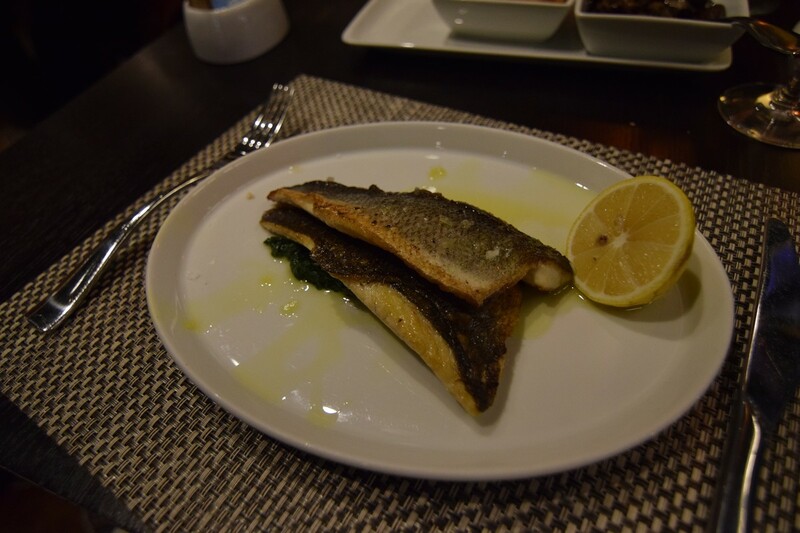 I went the unconventional route and ordered the branzino fish. 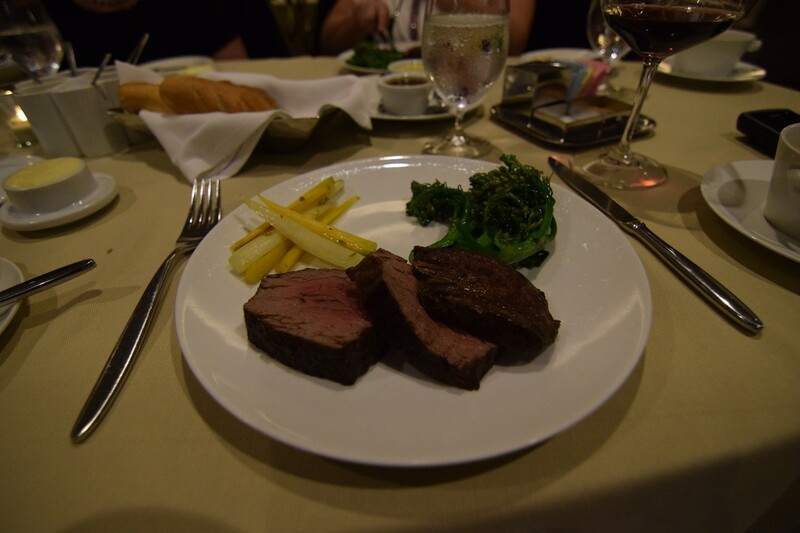 Unlike the branzino in Wonderland, which I have tended to find to be dry, this filet was quite tasty. 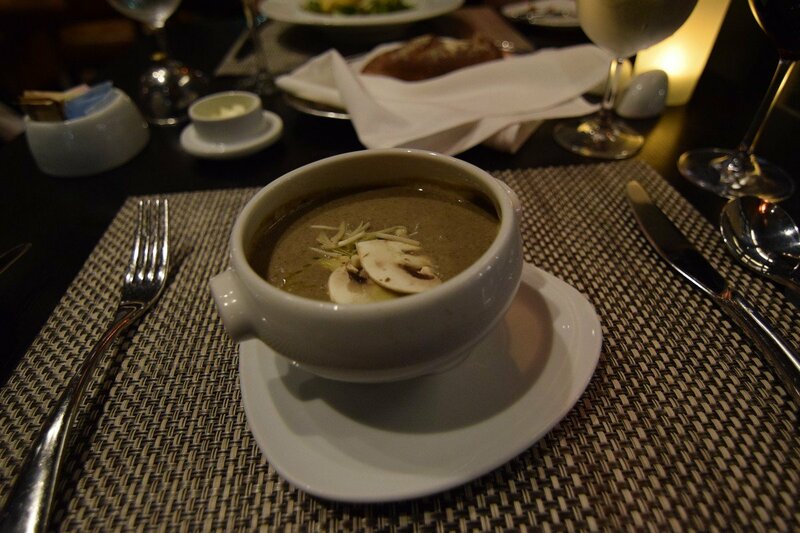 Since the new Chops menu removed the French onion soup, I tried the cream of mushroom soup. I really enjoyed it, probably just because it had truffle oil. 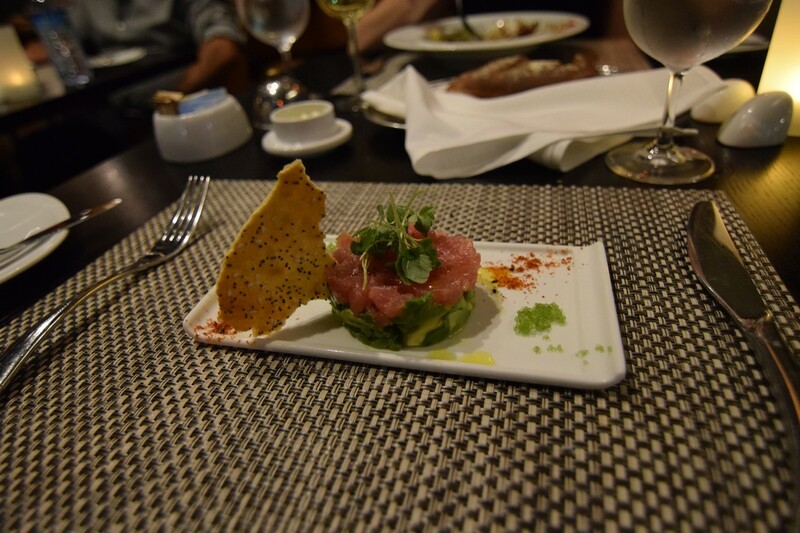 Becuase I am a sucker for anything tuna, I tried the tuna tartare. It was really good! We went to the casino after dinner, and my wife and I both made out quite well. The casino gods smiled down on us! 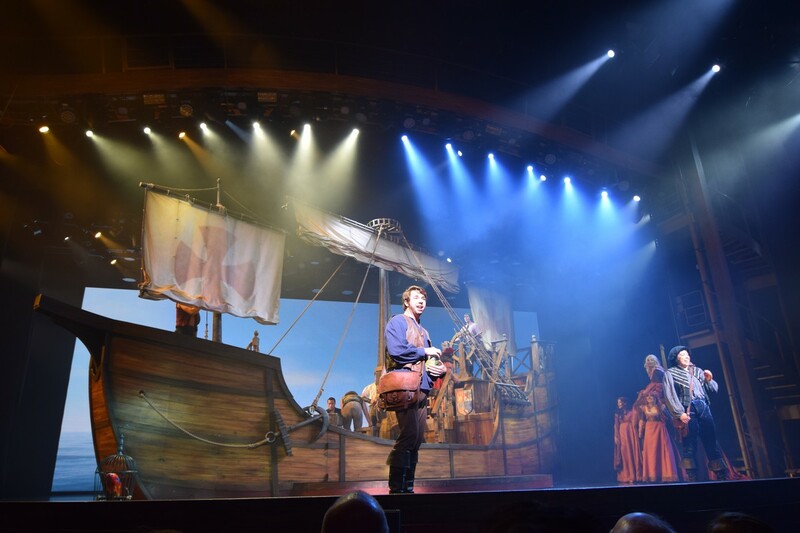 Our evening entertainment was Columbus, The Musical. 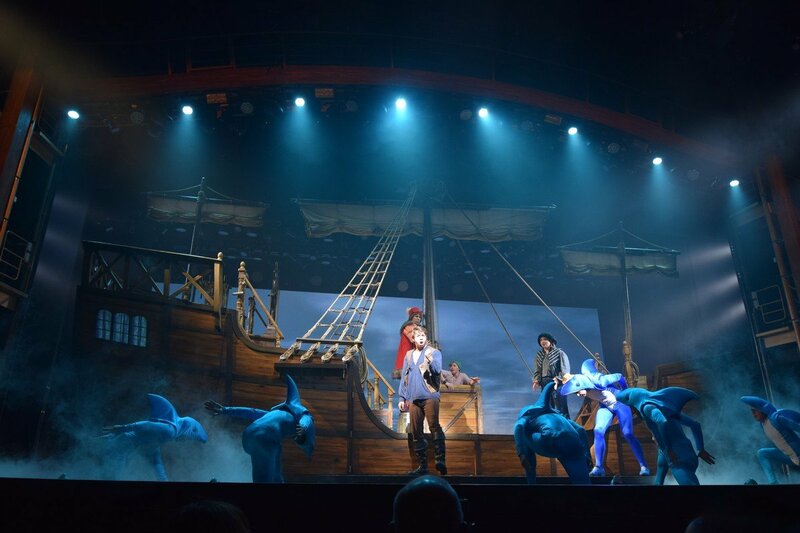 I have probably seen the show now five or six times, and it is still one of my favoirte productions on any ship. Wonderful story, great music, and tons of energy. 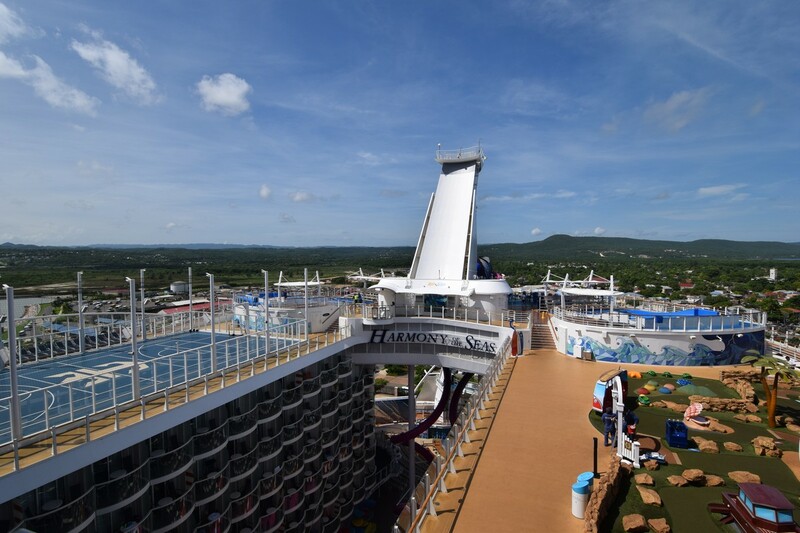 Tomorrow is our final port stop of Cozumel. 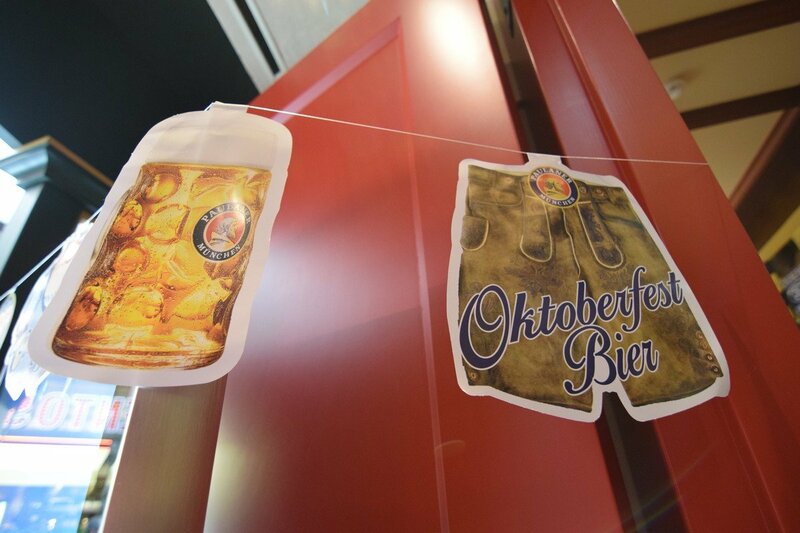 The pub had a mini Oktoberfest motif going today. Surprisingly I finally felt any kind of motion during the cruise later in the evening. It was quite minor, but the seas have been incredibly calm. 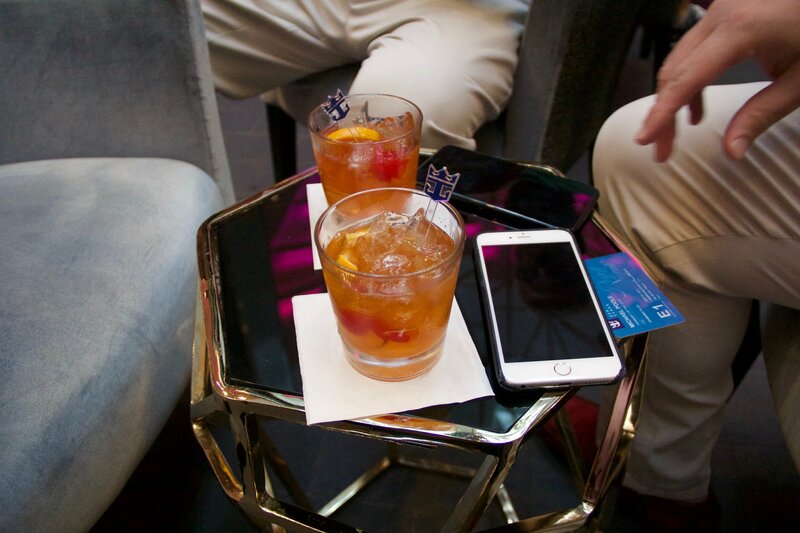 The drink card showed up late last night. Today was our second port day in Falmouth, Jamaica. We had a long stay here today, 10am-7pm I would imagine since many of the excursions are at least an hour away. I didn’t have any real plans today other than some shopping at the port and endless trips down the waterslide poolside. Not sure if anyone has noticed in my post, but I haven’t had breakfast all week. 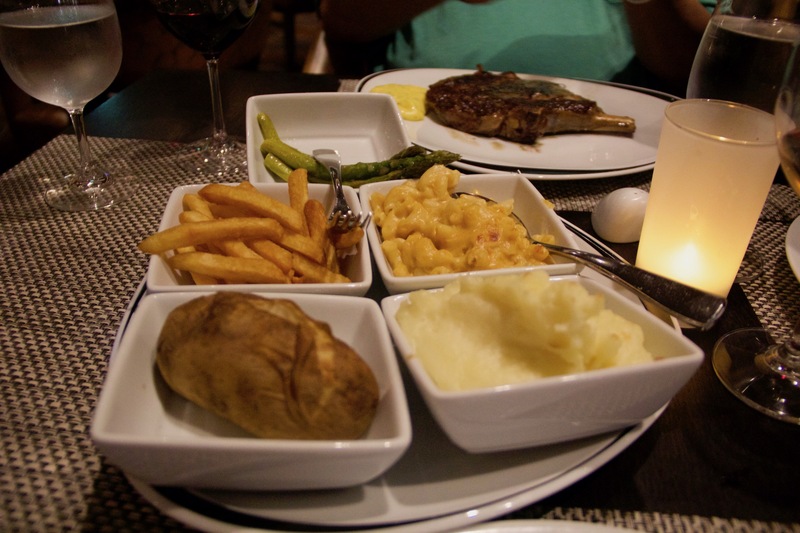 With this ultimate dining package the dinners are so large, I just have to skip a meal. 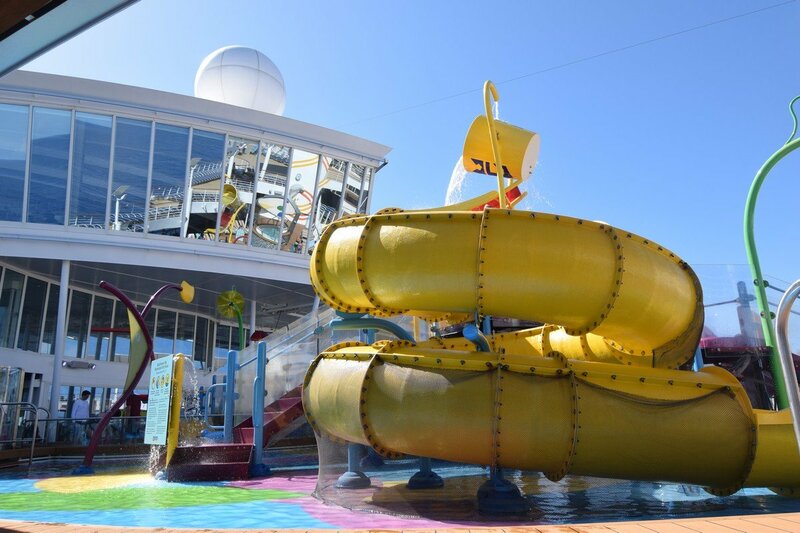 But I did head to the pool early morning and went down the slides ten times with zero lines. They didn’t have the green slide open until 2pm, but the two racers are my favorites anyways. At noon my friend Ron and I decided to get off the ship just to look around. We went into a few shops, and quickly noticed they all sell the same items. 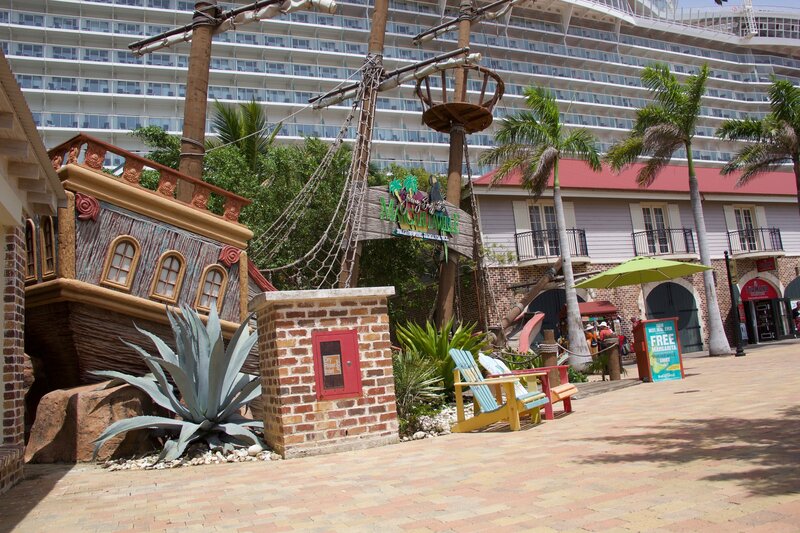 I bought a little gift to take home and we headed over to Jimmy Buffett’s Margaritaville’s. If you happen to have one of their t-shirts you get a free drink if you wear it here. We only had one drink each here, the cheapest cocktail was $9 each and beers $5. Once we made it back on board I headed to Park Café for lunch. 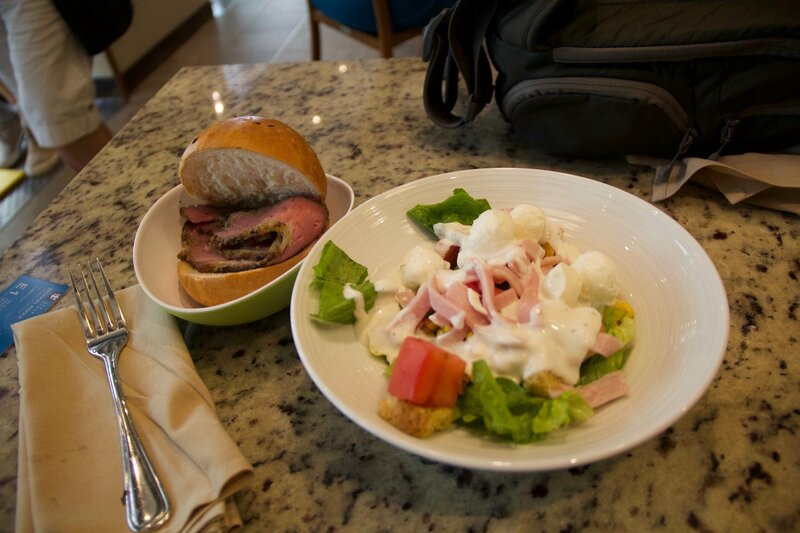 I had a large salad with ham and the roast beef sandwich. 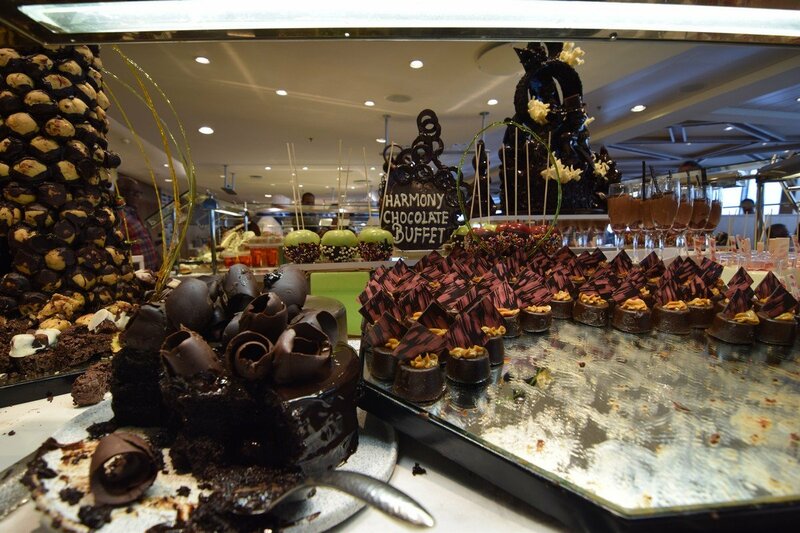 As usually the food in here was very enjoyable. 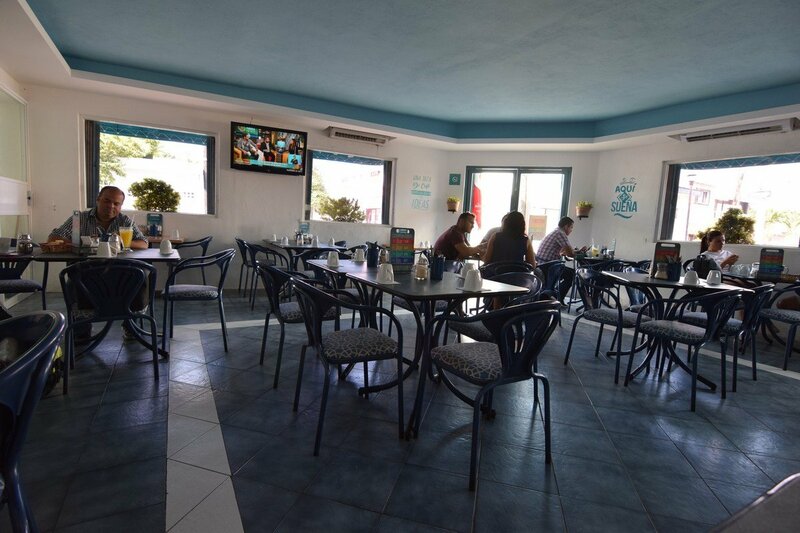 They did add a lot more seating to this Park Café, than her two sisters Oasis and Allure. For most of the afternoon, I just relaxed in the pool with some friends that also stayed on board. 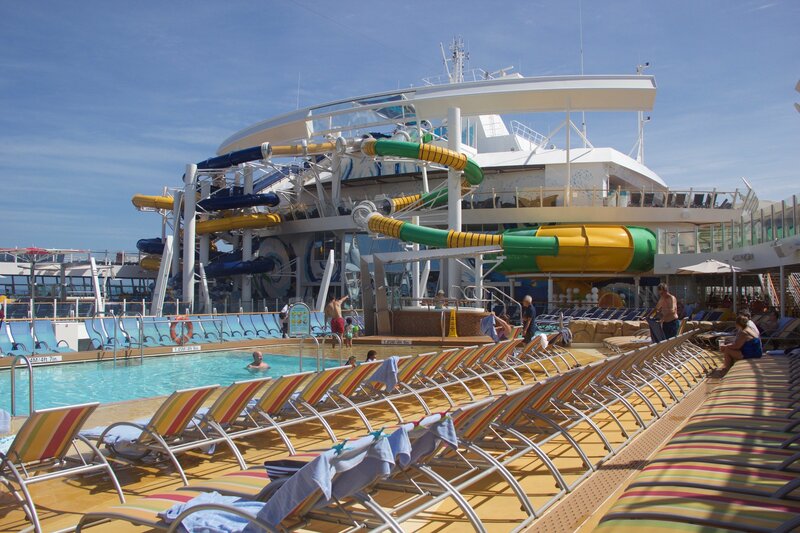 I will say, I did really enjoy the empty ship while everyone was in Jamaica. Tonight I wanted to have cocktails somewhere we haven’t been yet, I know that’s hard to believe but they just have so many options. We ended up at the rising tide bar and rode that up and down four times. 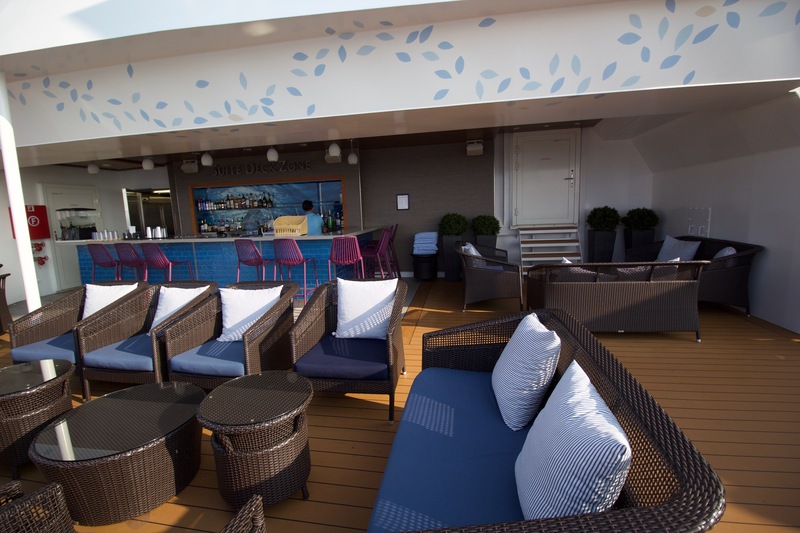 On Harmony they put soft chairs and tables VS her sister ships where they have bar stools and high tables. Dinner tonight was in Chops grill at 7:30pm, when we arrived they were so busy; but seated us right away. I’ve noticed every time I come here they are so busy, but tonight it didn’t affect our service. We had an amazing server who was laughing with us to make the meal so enjoyable. I ordered the shrimp cocktail and they serve this in the old 150 Central Park cucumber martini glasses. 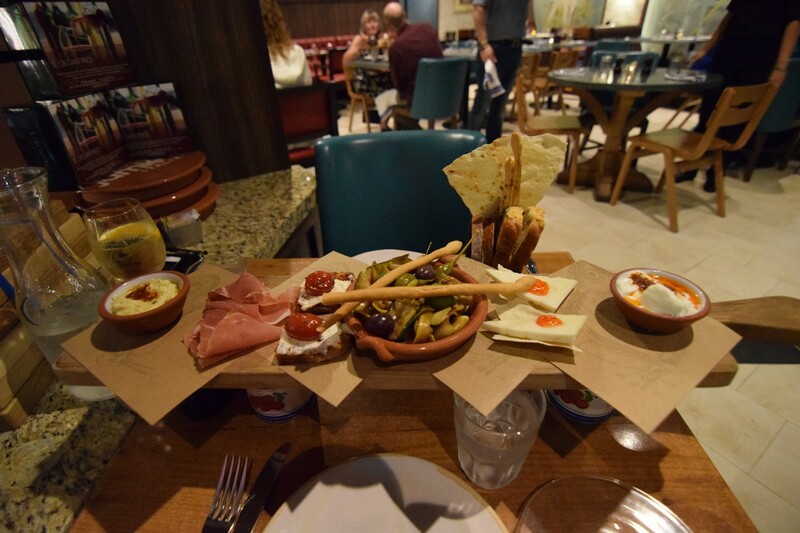 We ordered some side dishes for the middle of the table to share, during the main course. All our steaks came out perfect to how we ordered them, and I’ll come clean, I ate every bite! After dinner we had reservations for the comedy show at 10:30 in the Attic. This venue holds 200+ people for the comedy show, so I was curious how it would go. Of course, I had to sit front row and get involved with the show. The show was fun and only last an hour. 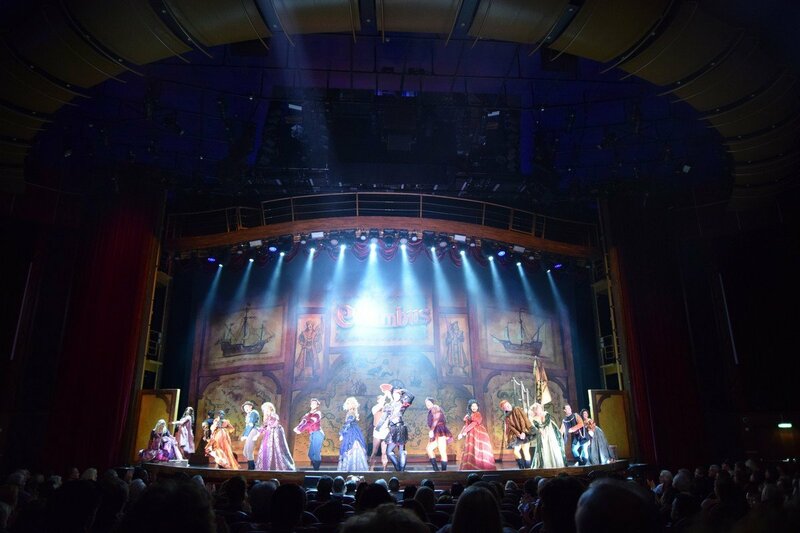 I do recommend making reservations for the show in the cruise planner, because the standby line was down the casino hallway. I ended the evening with their new nightclub themed party – Club RED. This is the first time I’ve ever seen anything like this on Royal’s ships. 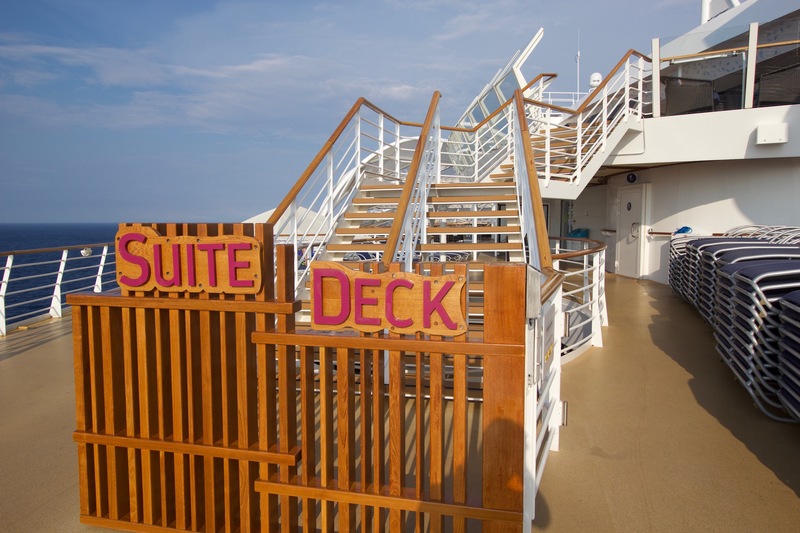 They held the party in Studio B on deck four. The had backdrops set up to take photos going into the party, almost reminded me of something you would see in Vegas. The party itself was for all ages as they started with fun music from 80’s and progressed into more hip-hop as the evening went on. I had an absolute blast and managed to stay up late tonight, of course grabbing some pizza on my way to bed. 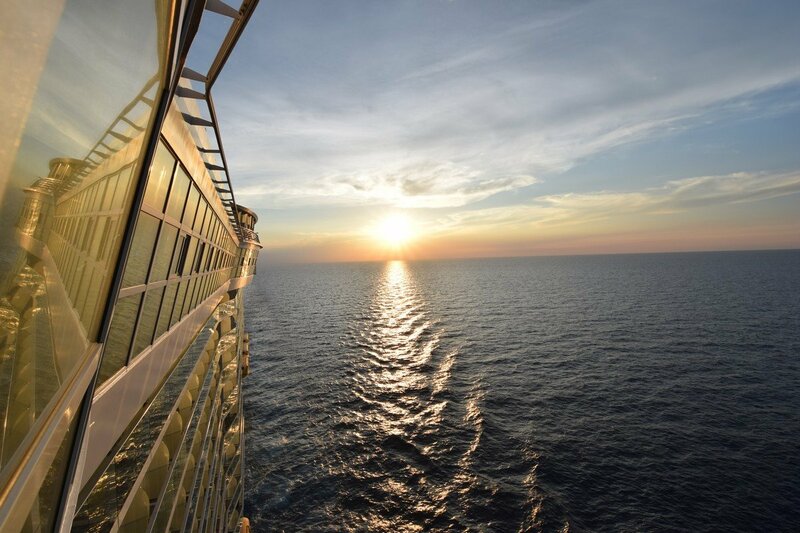 That completes my day four on board Harmony of the Seas; tomorrow we have a nice relaxing sea day as we head to Mexico. 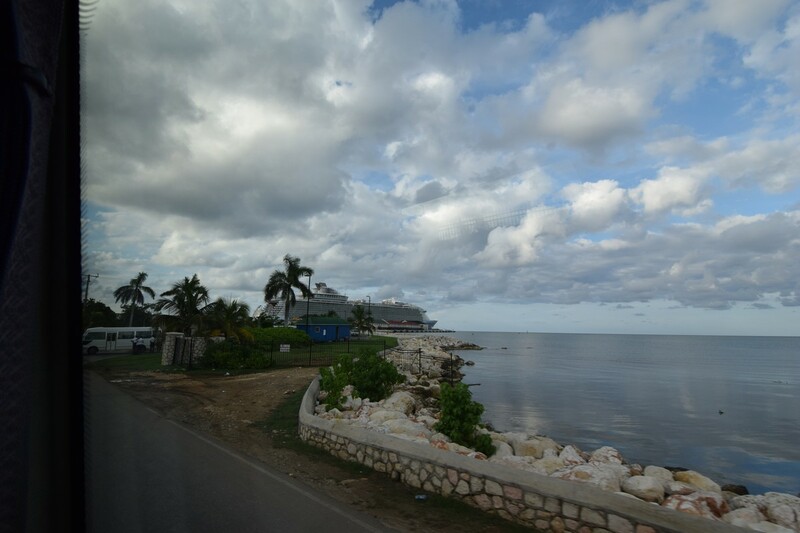 Our second port stop brings us to the port of Falmouth, Jamaica. Our shore excursion did not begin until 11:45am, so we took the opportunity to sleep in. Surprisingly, the kids actually slept until almost 10am, which means we all got a chance to catch up a bit on some lost sleep. We arrived in Falmouth right on time, and had breakfast at Park Cafe. The kids like a simple cereal breakfast, while my wife opts for the bagel bar and I get the vegetable sandwich. Happy faces all around. When it was time for our excursion, we met up and boarded a bus to take us to Bamboo Beach. 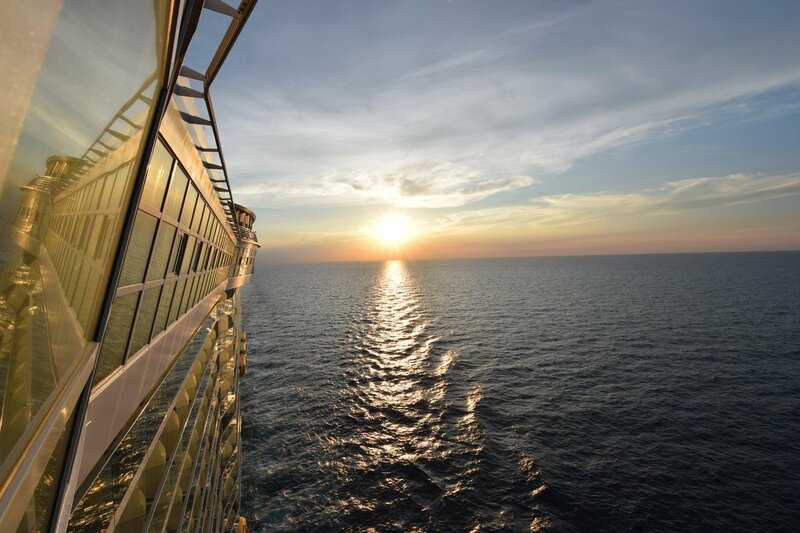 This is a Royal Caribbean excursion. 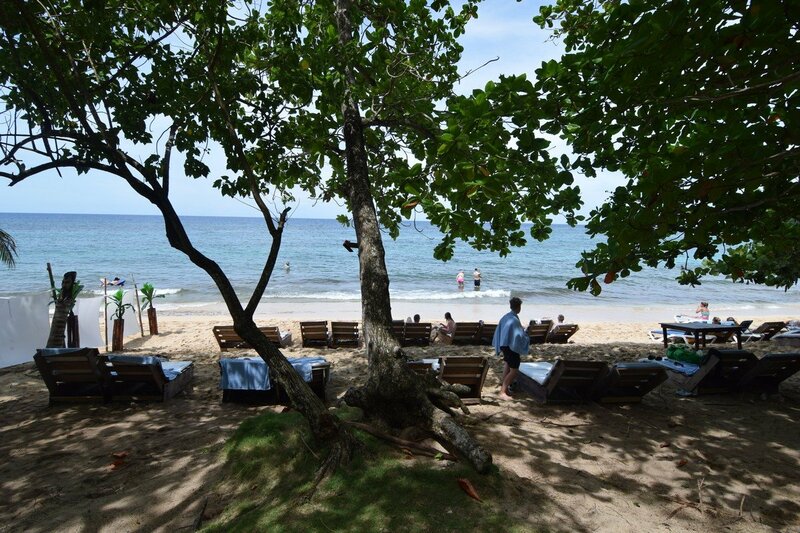 Bamboo Beach is a group excursion that we invited everyone who booked into our group to join us for. 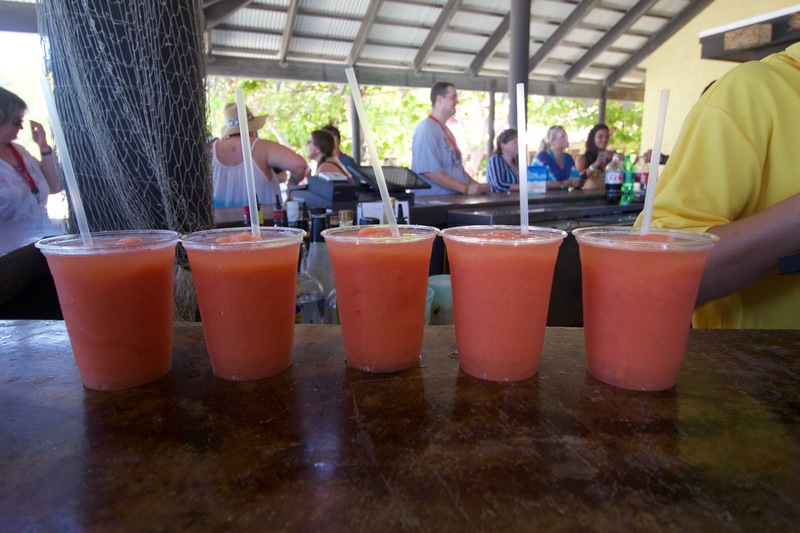 It is a beach excursion that features lunch and drinks a plenty. 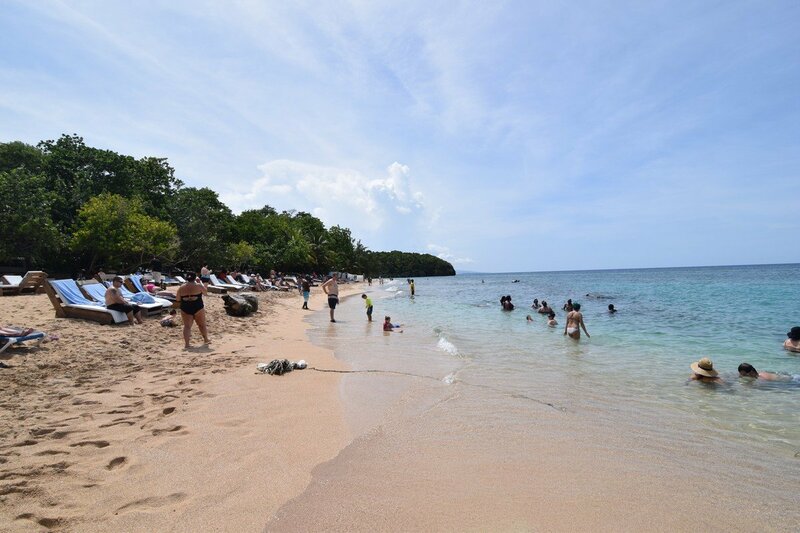 We boarded coach buses to take us about an hour and a half to the beach, which is near Ocho Rios. That is a long ride, but it had some great air conditioning that kept us all very comfortable. 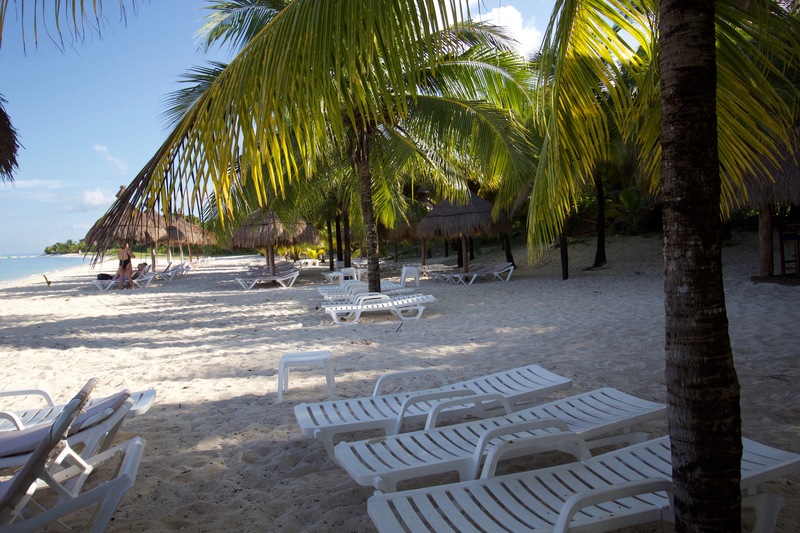 Once at the beach, we found seats in the shade and enjoyed a day full of swimming. We spent about 3 hours there, and my kids spent nearly the entire time playing and swimming in the ocean. It was the perfect water temperature and rock-free sand. I liked the beach, which had just the right amount of waves and perfect temperature. Like many beach excursions of this nature, it seemed like the beach oversold how many people could visit and service was spotty at times. The buses brought us back to Falmouth about thirty minutes prior to our all-aboard time, which meant we all had to get back to the room for much-needed showers and a change for dinner. I brought the kids for a bite to eat in the Windjammer and then dropped them off at Adventure Ocean. 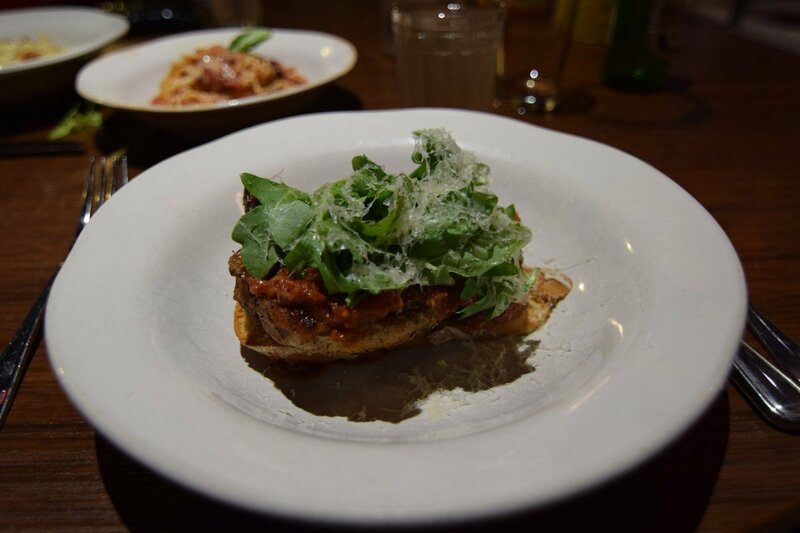 Dinner this evening brought us to Jamie's Italian in Central Park. 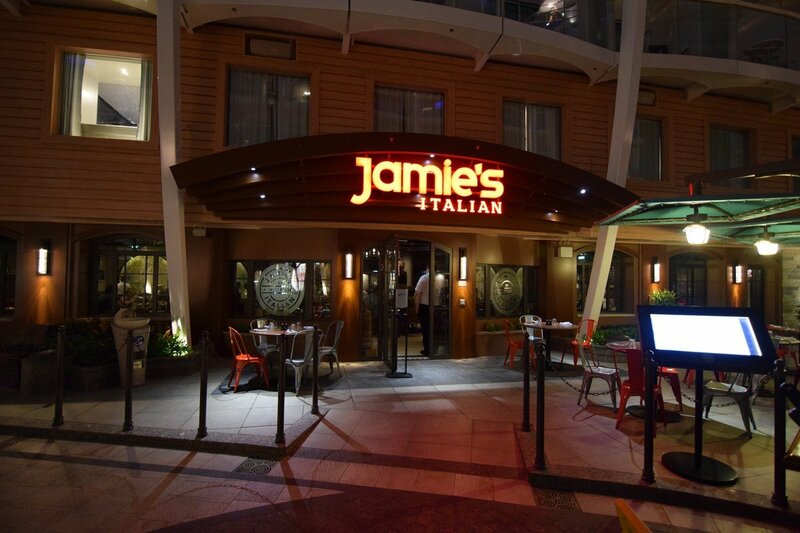 We dined at Jamie's Italian on Harmony of the Seas in July, and this meal was even better than last time. 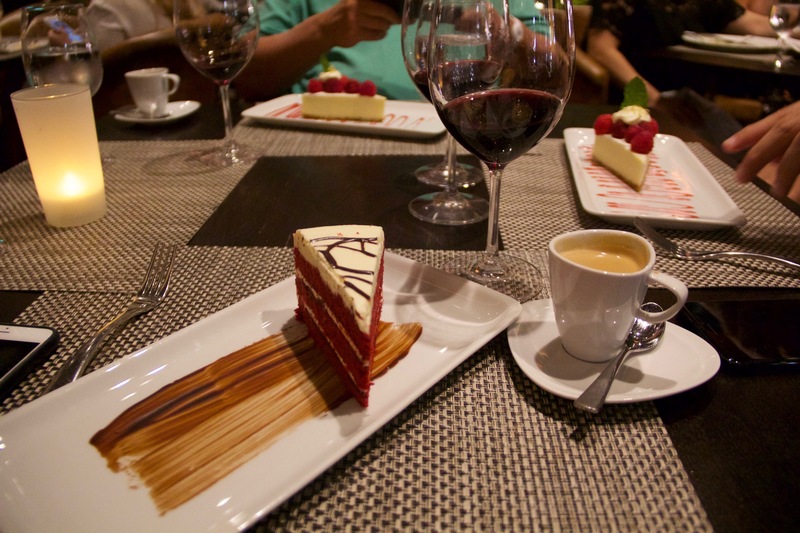 I think the menu has hits and misses, but we seemed to do quite well with our choices. I tried the burger, which had great flavor. 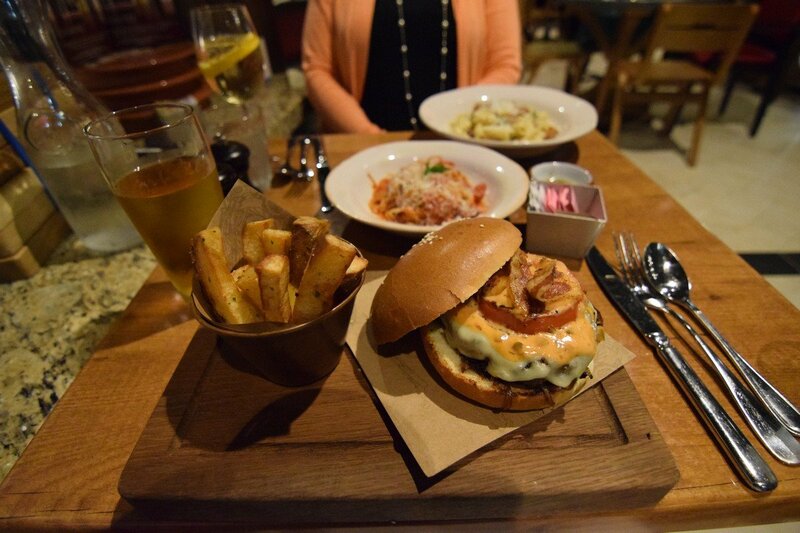 Plus, our waiter told us Jamie Oliver crafted the burger to be healthy(er), so I took solace in less guilt. For dessert, we got a sampler dish that allowed to try all of them. 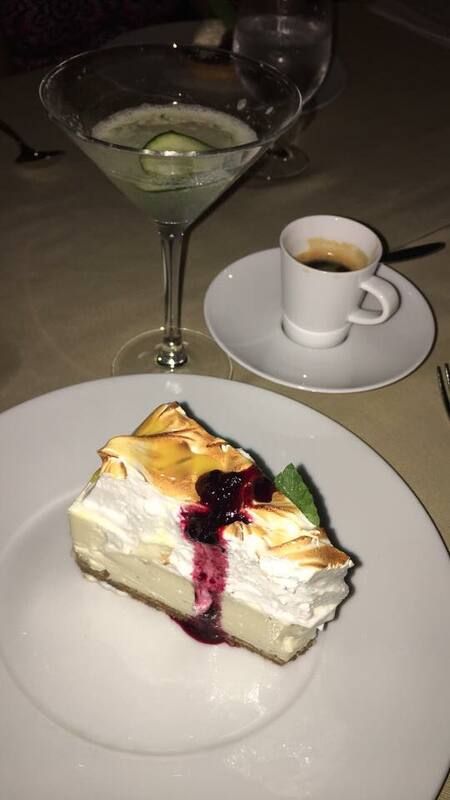 So good and so filling! 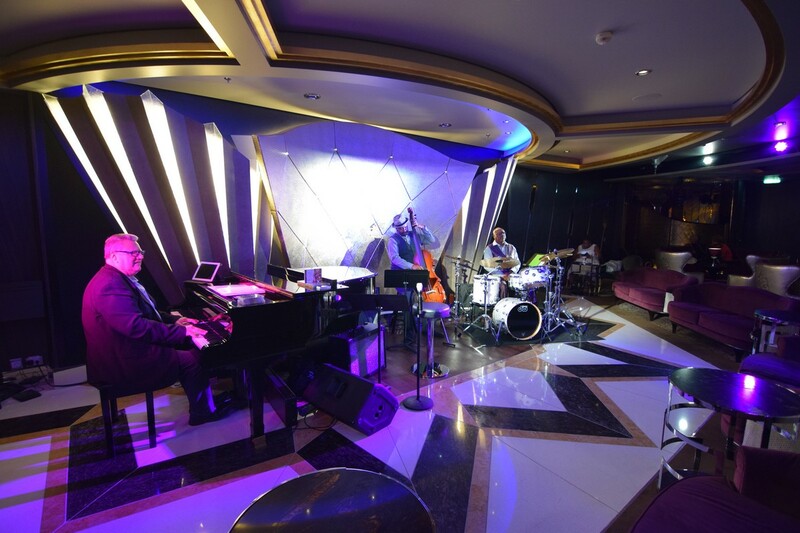 Our entertainment this evening brought us to Jazz on 4 for some live jazz music. Terrific talent in a fantastic venue. 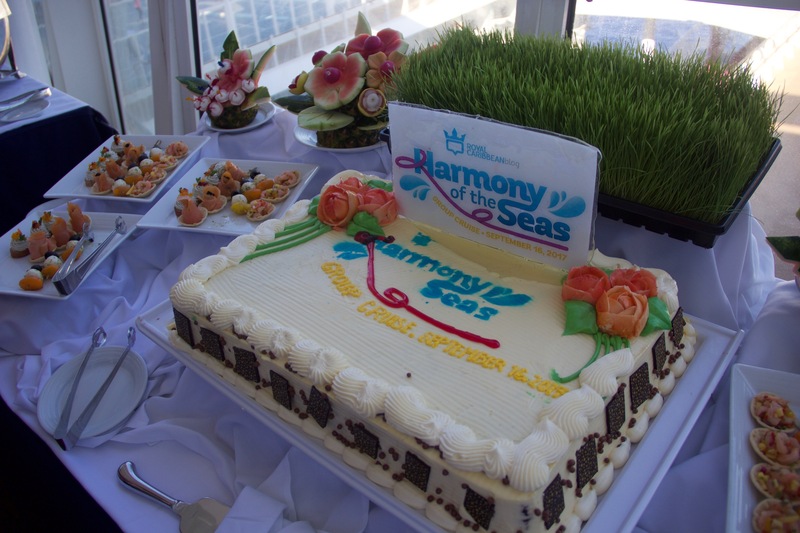 Tomorrow is another sea day, and that means more time to try out a few different things on Harmony! I am sure this will jinx me, but the ocean has been the smoothest I have ever experienced on any cruise. The Voom internet has been flying. Great performance all over, whether for streaming video or just basic internet usage. 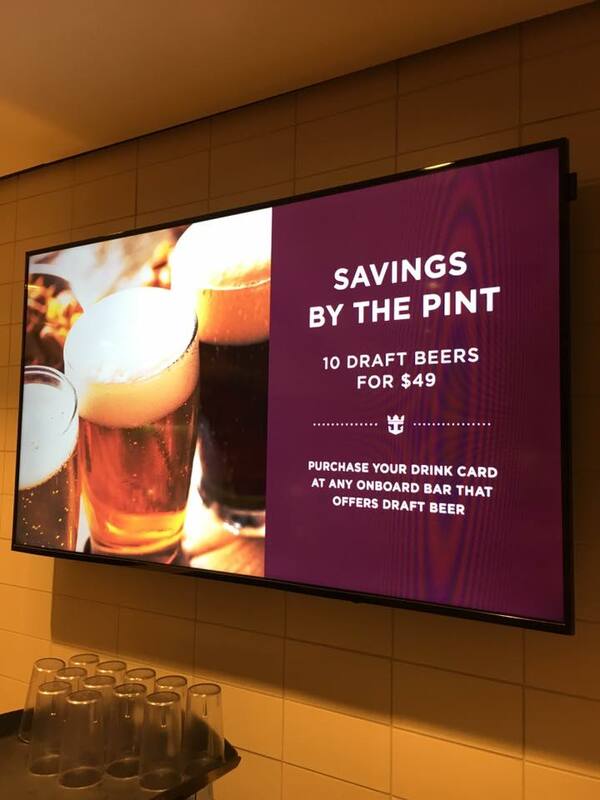 I saw this sign at Cafe Promenade that offers 10 draft beers for $49. 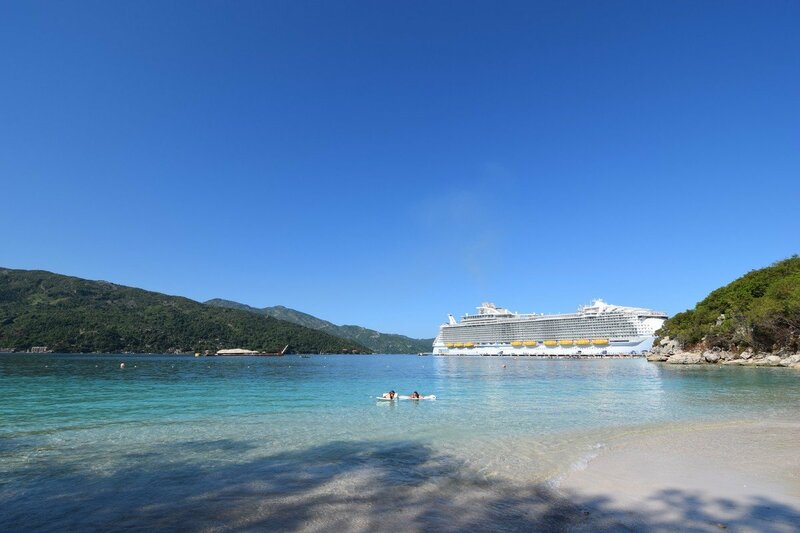 Today was our first port of call, in Royal Caribbean’s private island of Labadee, Haiti. I woke up at 7:15am to a band playing on the pier, marching back and forth. 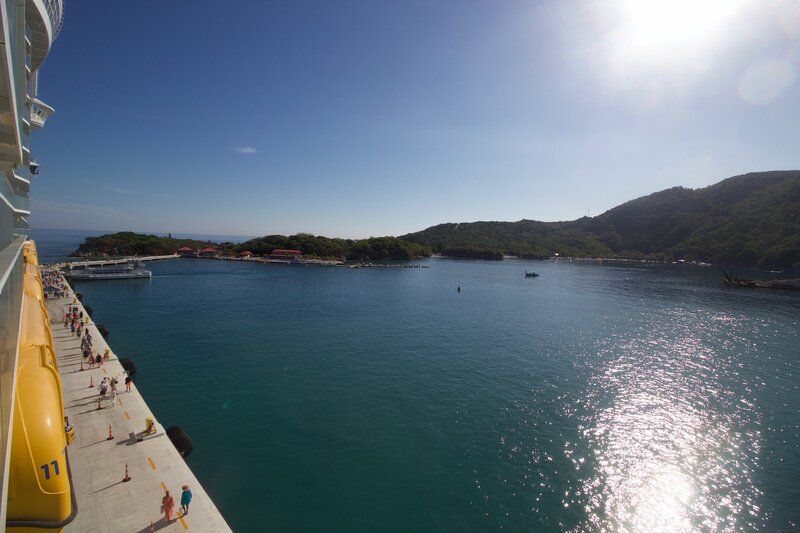 They always do something fun to welcome the ships in Labadee, it’s like a morning wake-up call. We took things kind of slow on board for an hour or so, I was enjoying my coffee at Park Café. 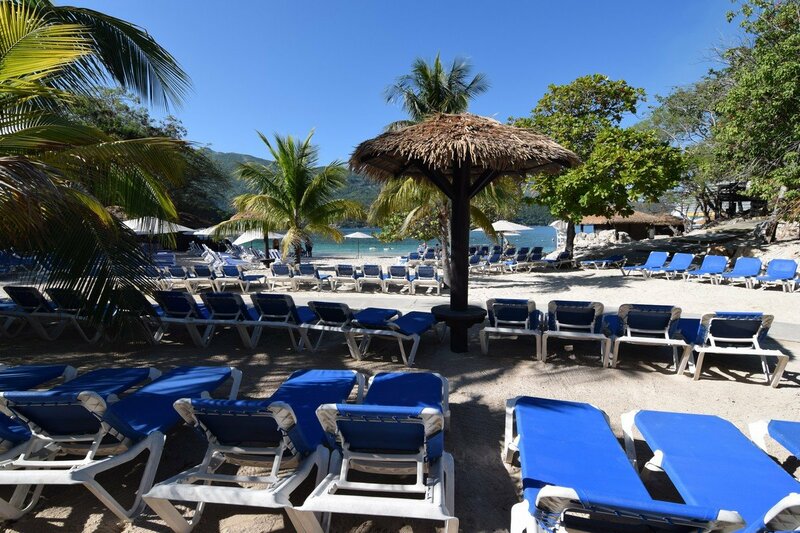 At 9am we headed over to Labadee, my plans today were laying in my cabana on Nellie’s beach. I’ve never stayed in a cabana before, so this was a first for me. I walked over to Nellie’s beach, which is only 5 minutes. If you are in barefoot beach (grand suites and above) they will drive you over on carts. It wasn’t a long walk at all and it was nice seeing everything along the way. 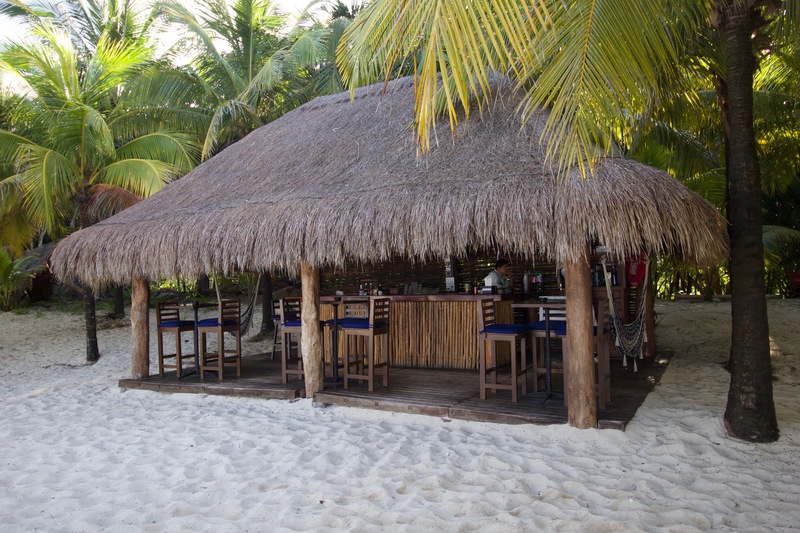 Once we arrived there was check-in tiki hut and he took us right over to our cabana, (NB1). Our location was behind a wall, so it was a little separated from the main beach. It came with five 1-liter bottles of Evian, beach towels, and two floating mats. 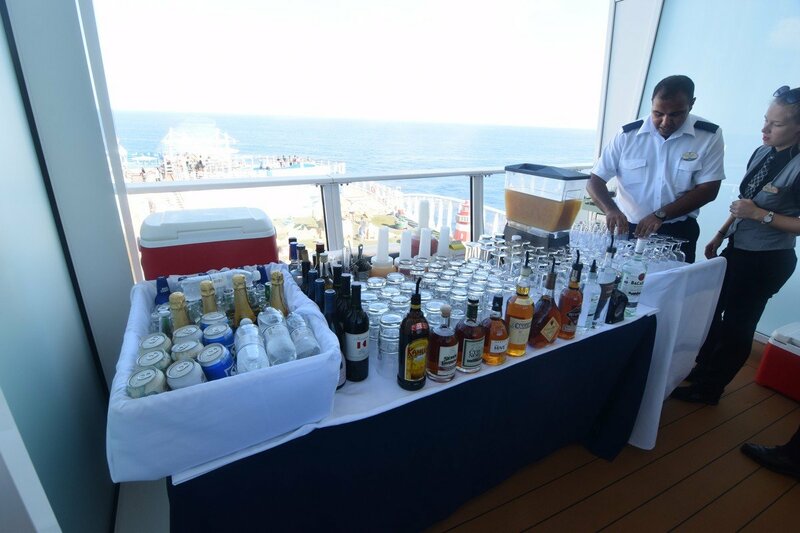 We also had our private bartender (they called him the butler, but I’m going to stick with bartender). 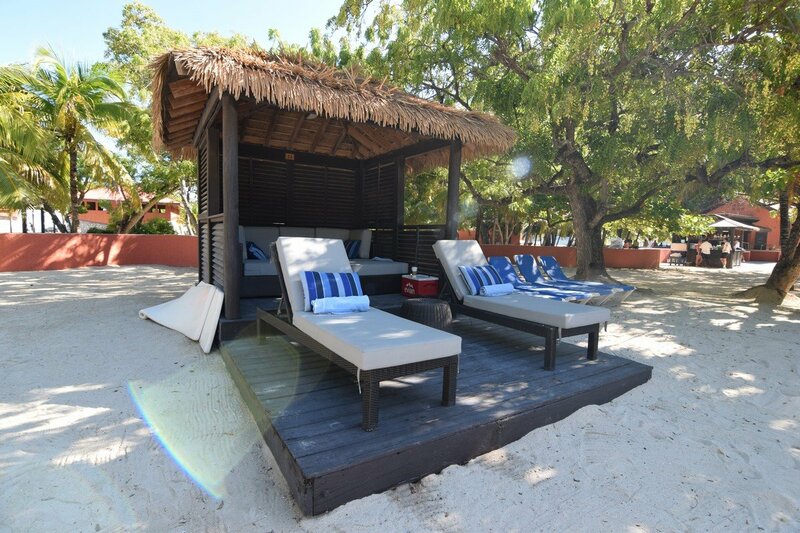 He only had 4 cabanas to work with, so he was always around to get anything you needed. 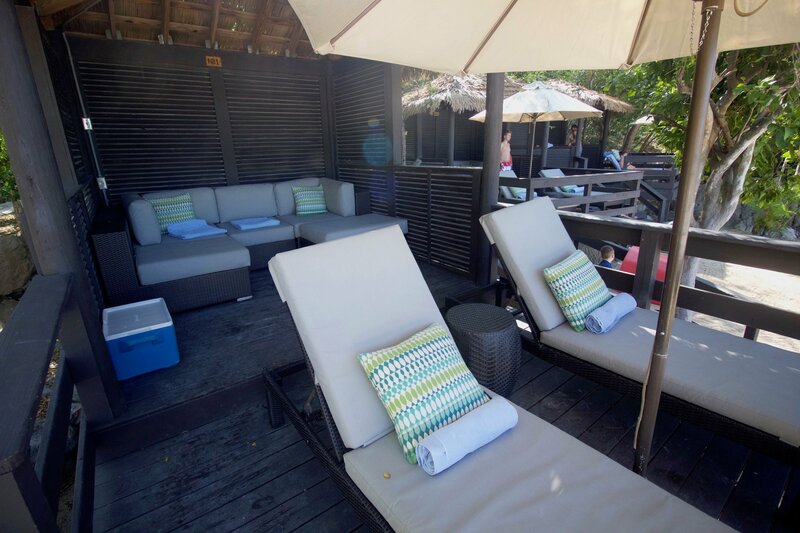 I really enjoyed the cabana; it was so enjoyable to be sitting in the shade with a fan above you blowing. 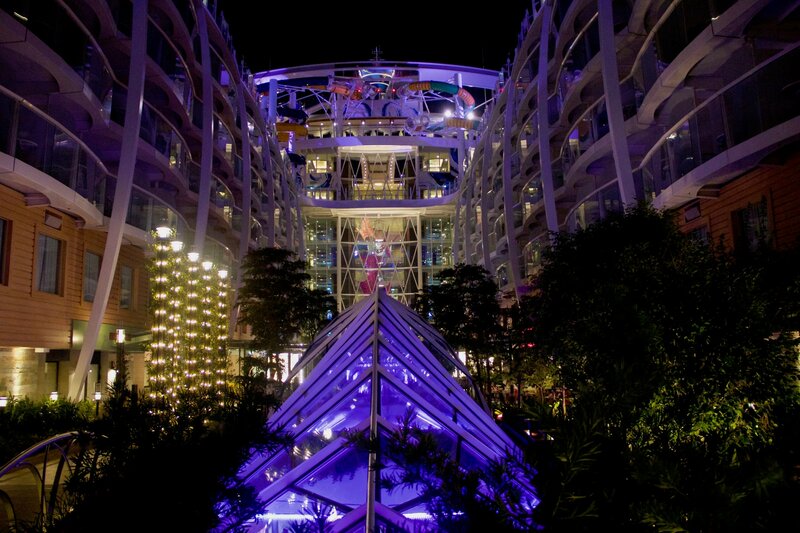 I will stay in one again, but likely wouldn’t do it every cruise due to the cost. 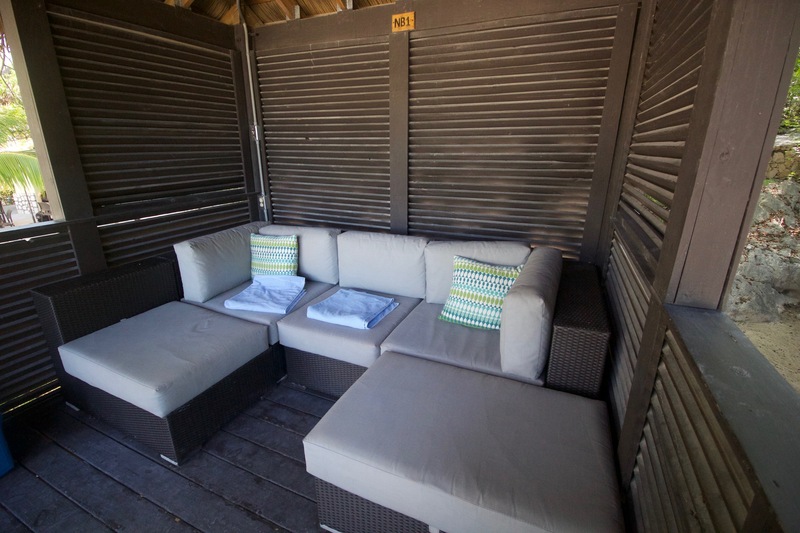 I’ll also note there are plugs in the cabana if you need to charge a phone or small music speaker, etc. 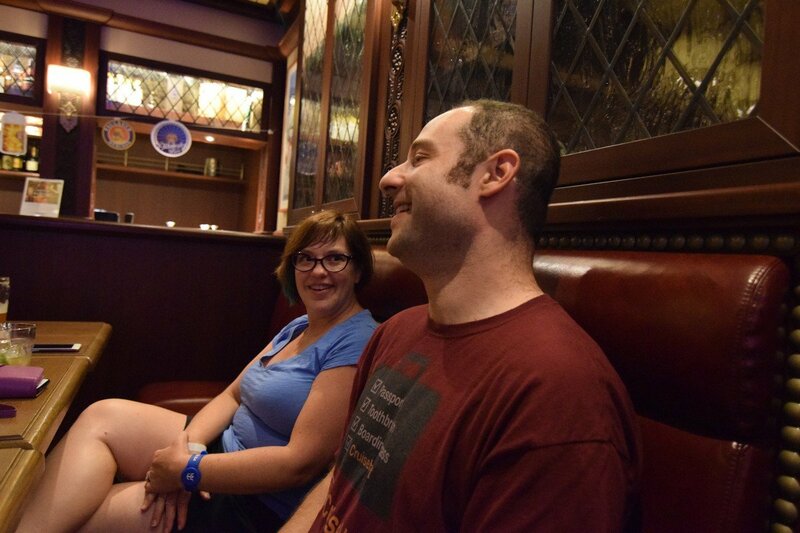 At 11am we had our labadoozie meet-up with the blog group at schooner bar. 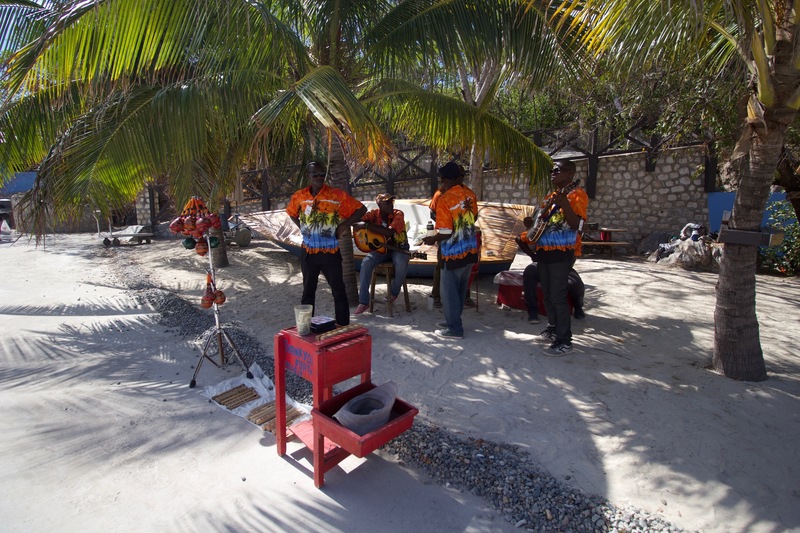 But this isn’t the schooner bar on board, the very large bar on Adrenaline beach. It was fun seeing everyone together, we always run into people across the ship but not always all together. 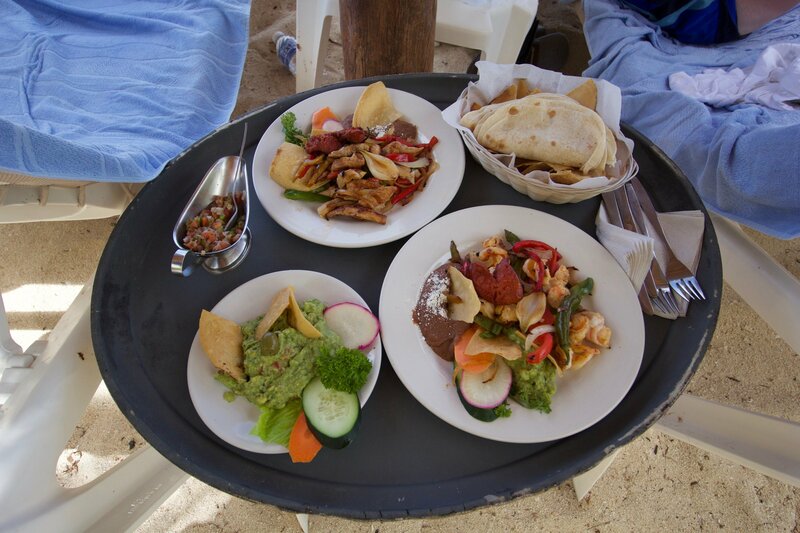 There is no upgraded lunch for cabanas on Nellie’s beach, so my friends just brought me a plate over. For the rest of the afternoon we relaxed in the cabana and stayed until the very end of the day. 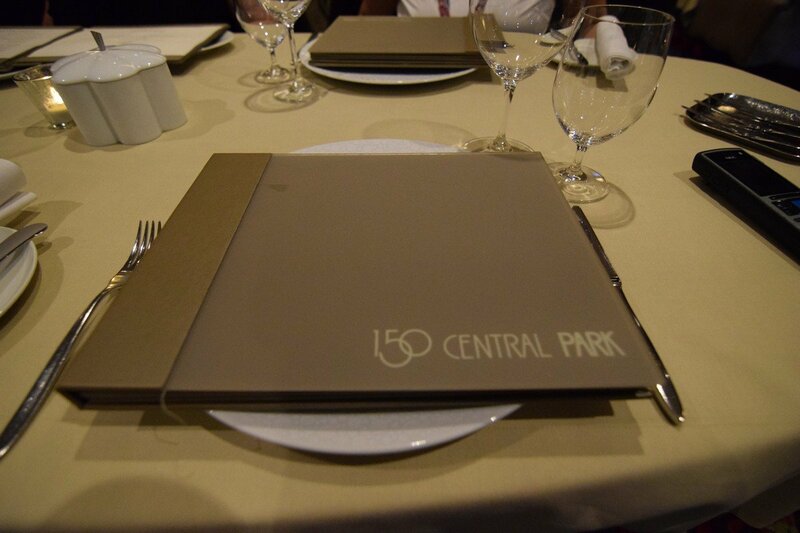 Tonight we had dinner at 150 Central Park at 7pm. 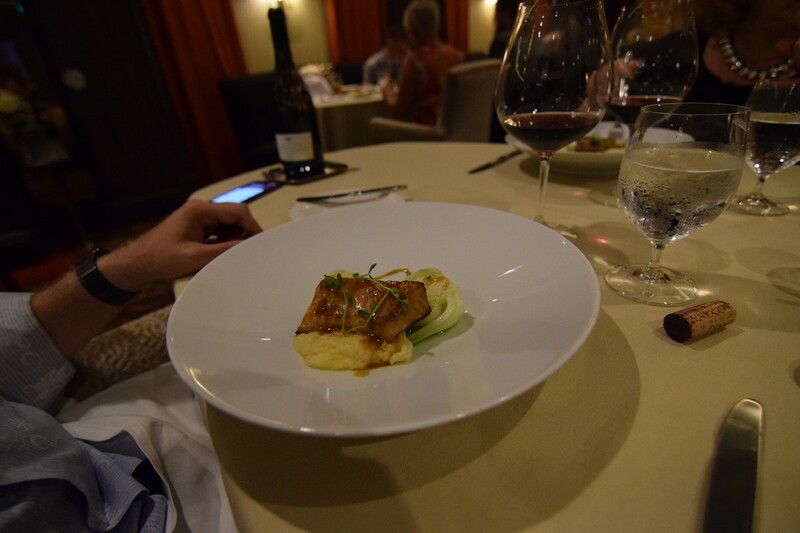 This has quickly become one of my favorite restaurants on board with their new set-menu now. 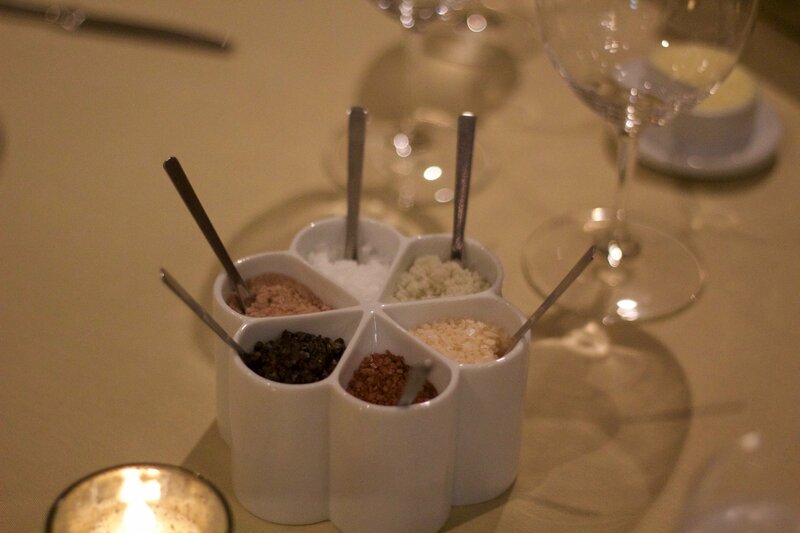 They went over the six salts with our bread right when we arrived. The main highlight is the cucumber martini. I don’t usually drink martinis but this is their signature drink ($15 or $2 with drink package) and it’s so smooth and refreshing. The main course we ordered the filet tenderloin, cut tableside. 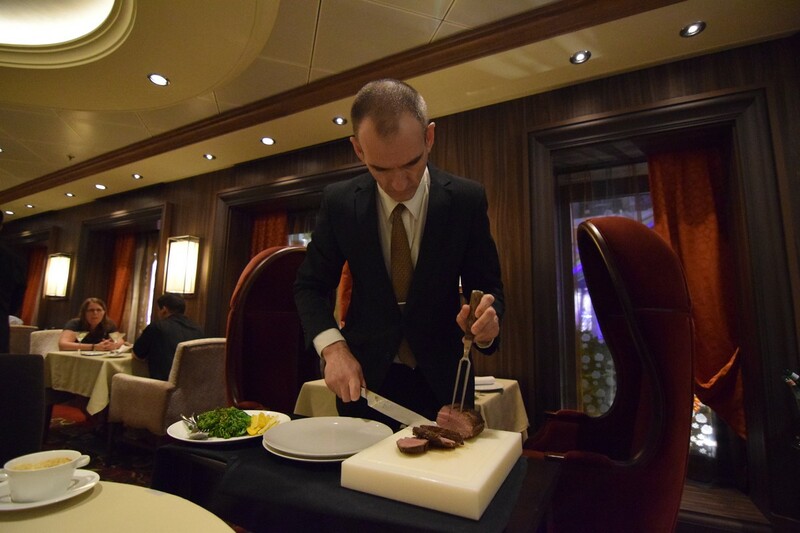 This meat is so tender and likely one of the best meats on board. For desert we had them bring the cheesecake from Jamie’s Italian, oh this desert is amazing! After dinner I went down to the pub with the group for a few hours. They had a 50’s & 60’s street party, brand new show and it was a blast. I will say, most of the songs I’ve never heard of before. There is also a 90’s street parade later in the week, which I’m really looking forward to. 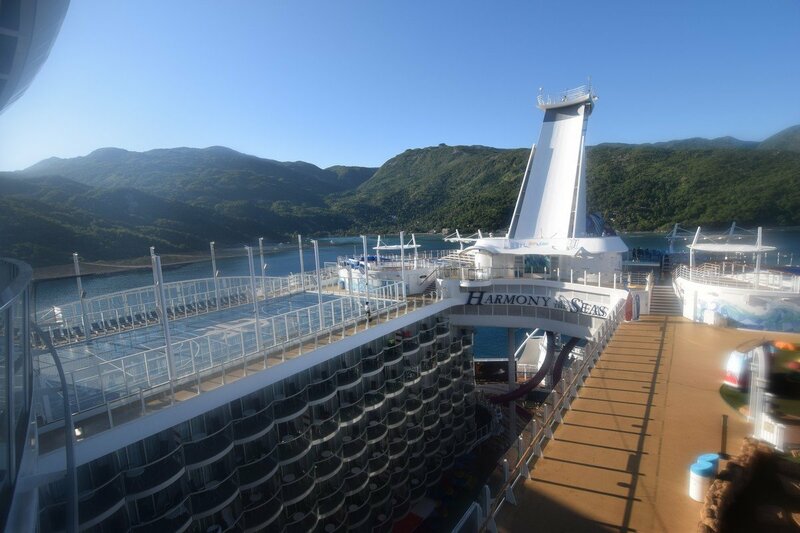 That recaps my day three in Labadee, tomorrow we are in Falmouth, Jamaica. 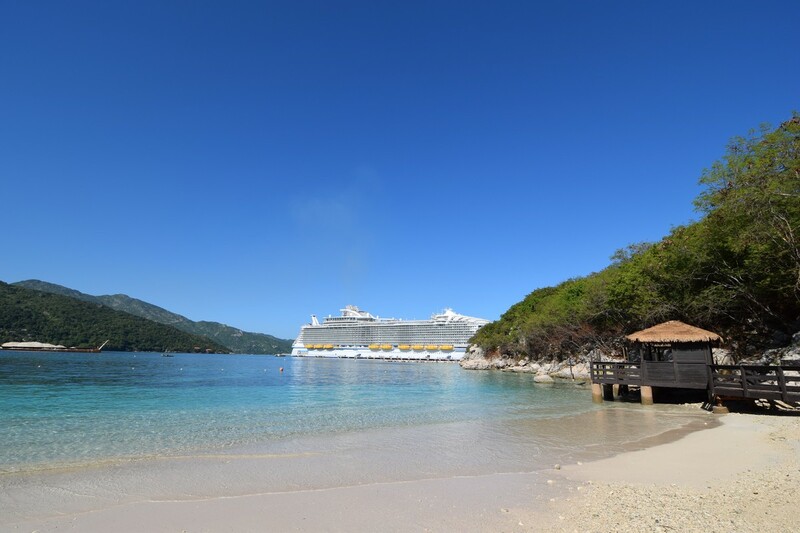 Our first port stop brings us to Royal Caribbean's private destination of Labadee. I always look forward to stops here, and today was no different. We ended up arriving a bit earlier than scheduled, and the gangway opened up in the eight o'clock hour. For us, we got the kids fed and walked off the ship a little after 9am. 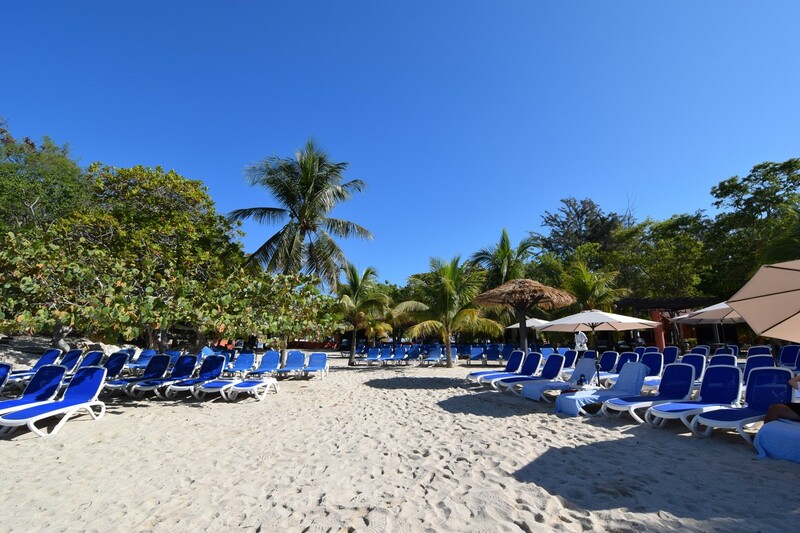 Weather wise, there was not a cloud in the sky and the kind of day you dream about for any beach day. 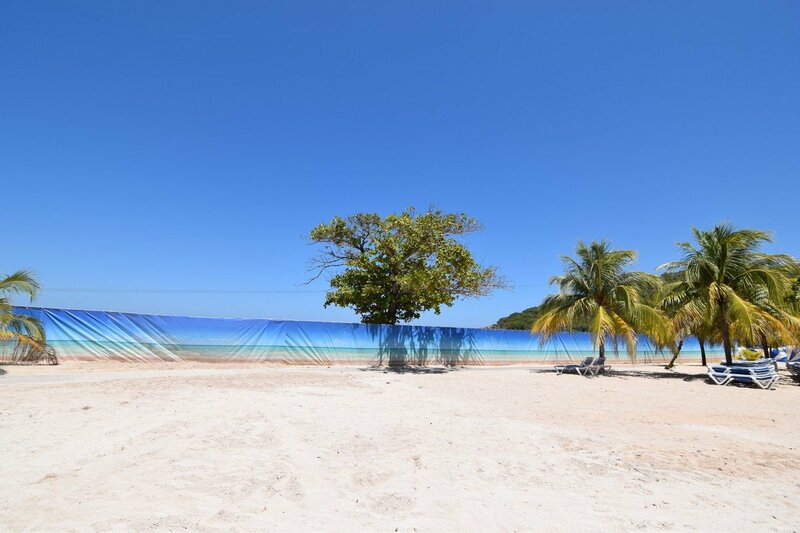 However, September in the Caribbean is anything but cold. It may not have been as hot as this sign indicated, but rest assured it was quite warm today. 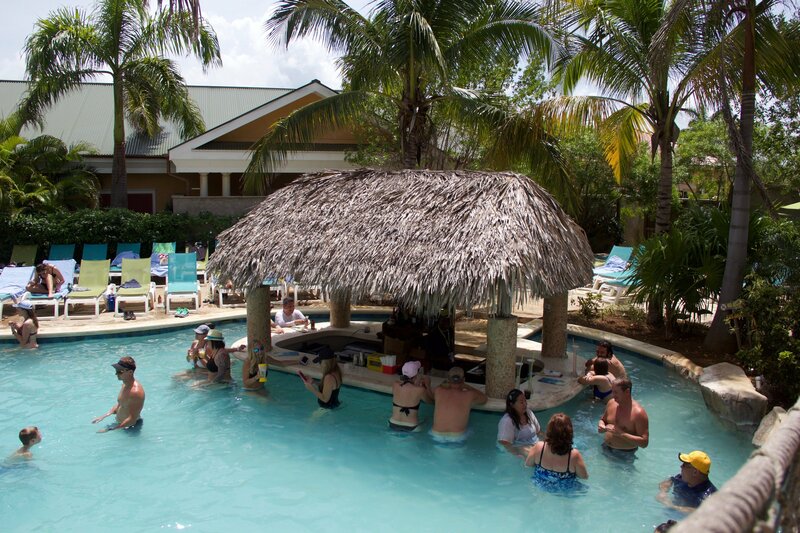 We rented a cabana on Barefoot Beach, which is something our family does on every trip. 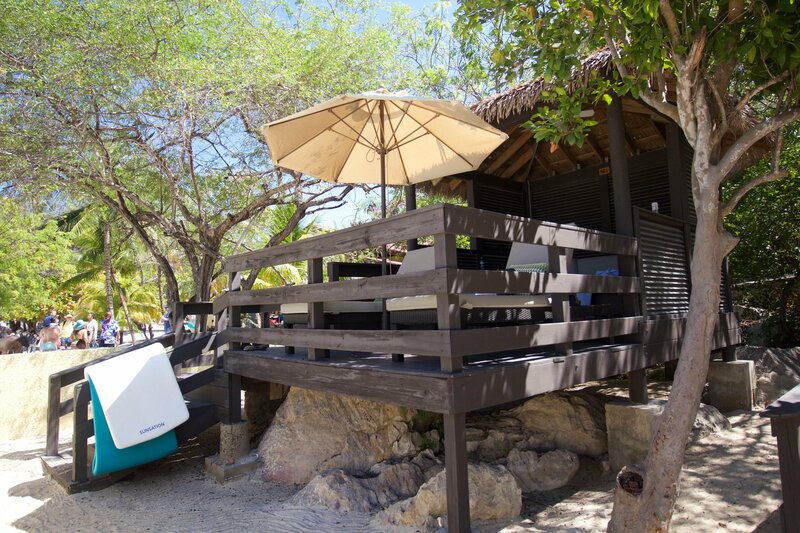 We rented a standard cabana, which offers us a perfect spot for our family to enjoy beach time. 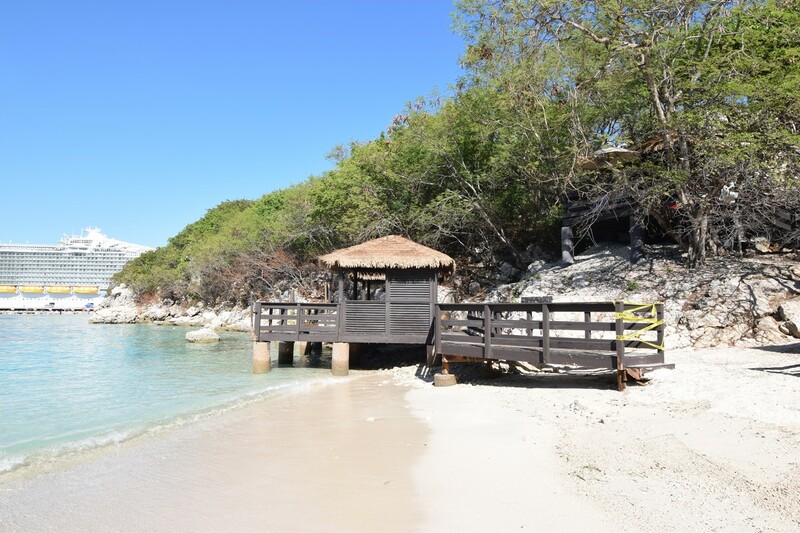 Speaking of Barefoot Beach, the over the water cabanas suffered some damage from Hurricane Irma. Some were completely missing (presumably pulled down to make way for a new one) and others were still damaged. Luckily, there was not other visible damage to Labadee and I was glad to see things still functioning well overall. 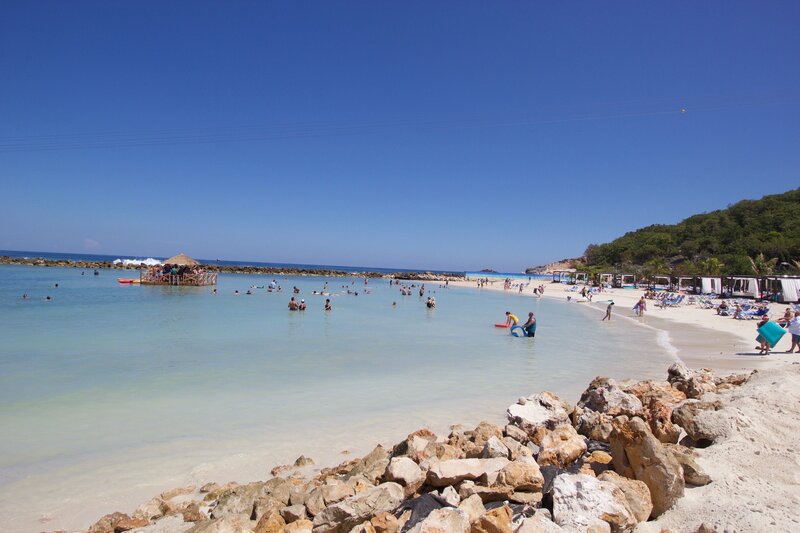 Elsewhere on Labadee, there is some visible construction of the upgrades taking place. 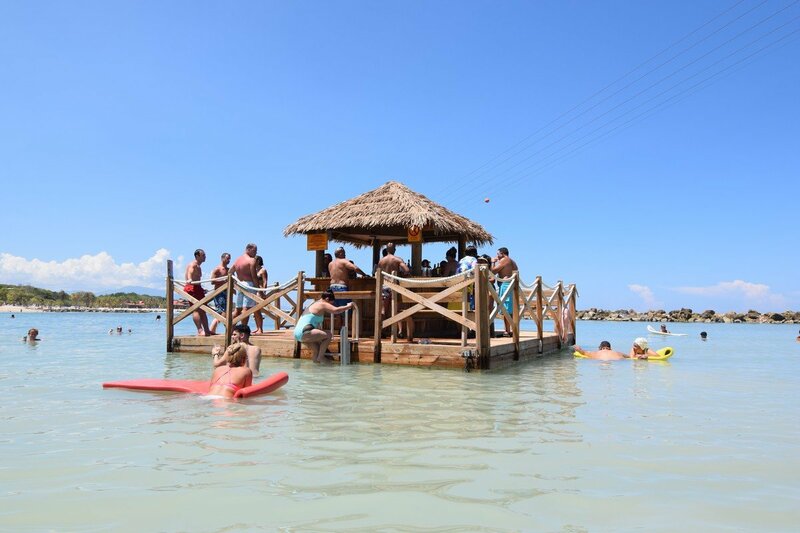 I even took a walk to the new floating bar off of Adrenaline Beach. 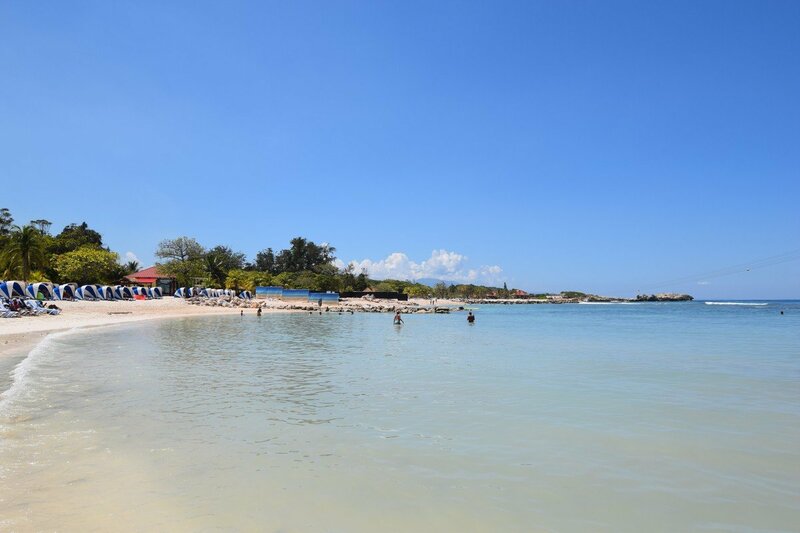 We had a great day in Labadee. 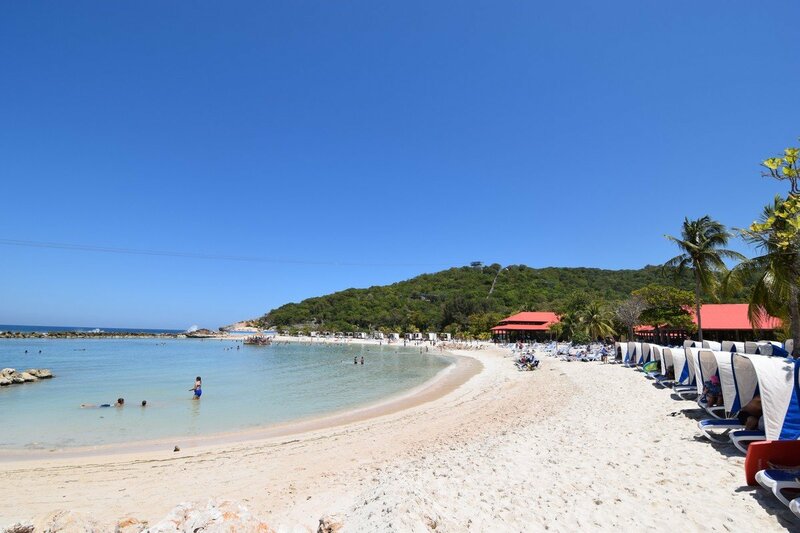 In fact, it was the longest we have spent in Labadee ever with the kids. They had a blast and it was a lot of fun all around. Back onboard Harmony of the Seas, the kids and I took a much needed shower and nap. Sometimes a solid hour nap does wonders for the soul. 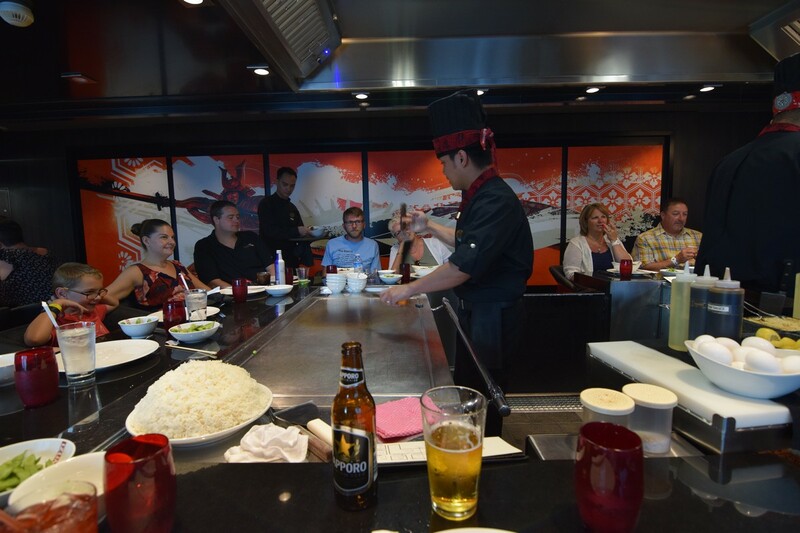 We had another early dinner this evening, back at Izumi for hibachi. 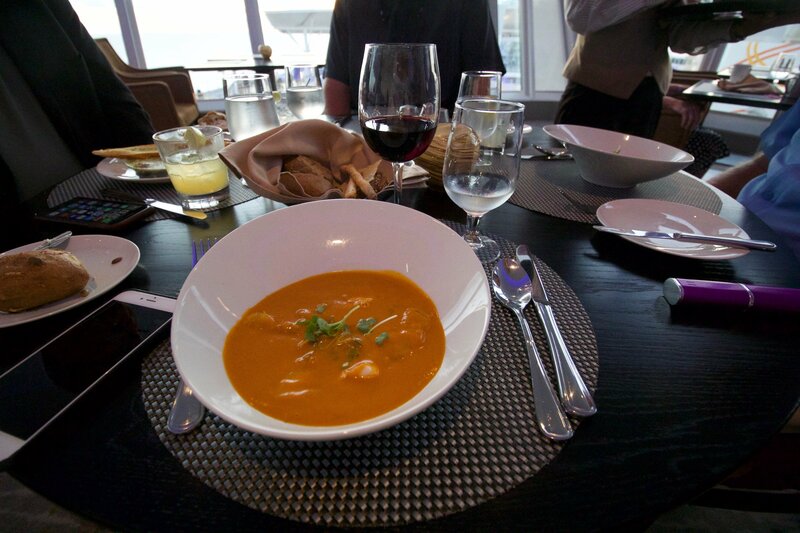 It was another great meal and I can see why so many people really enjoy it. 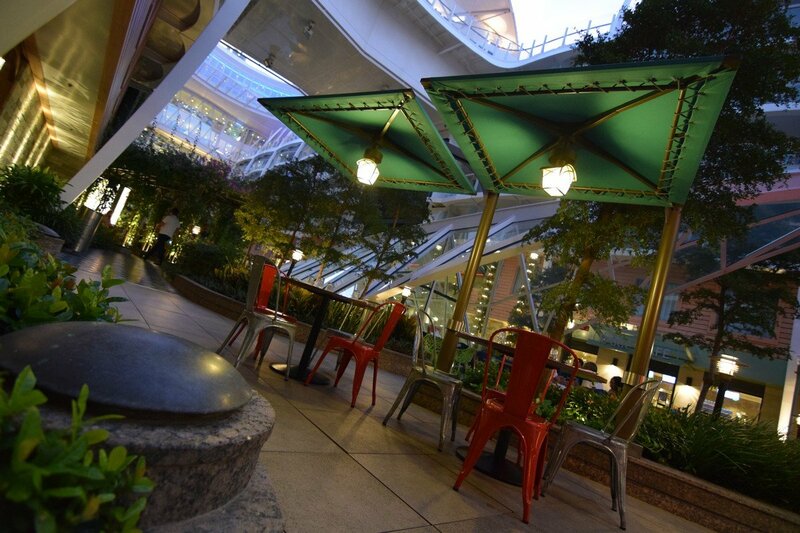 We spent our evening on the Royal Promenade. There was Broadway trivia, piano singalongs and a 50's/60's party. I loved it! 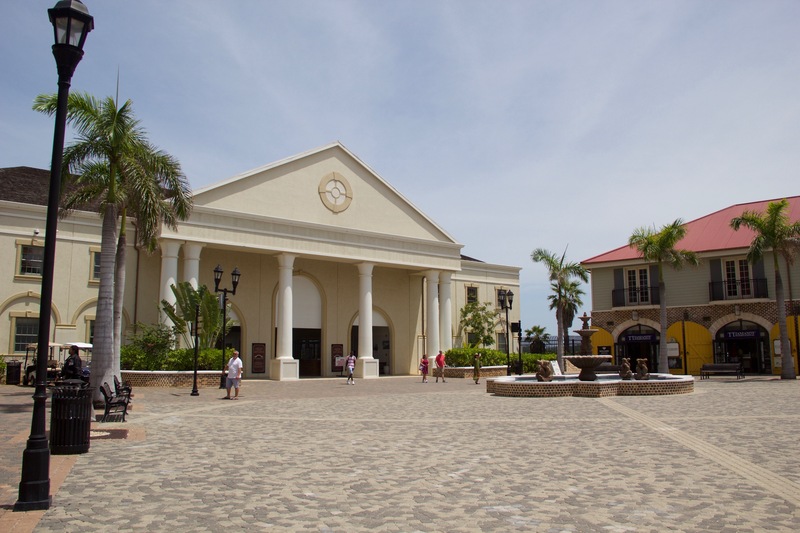 Tomorrow we are visiting Falmouth, Jamaica. 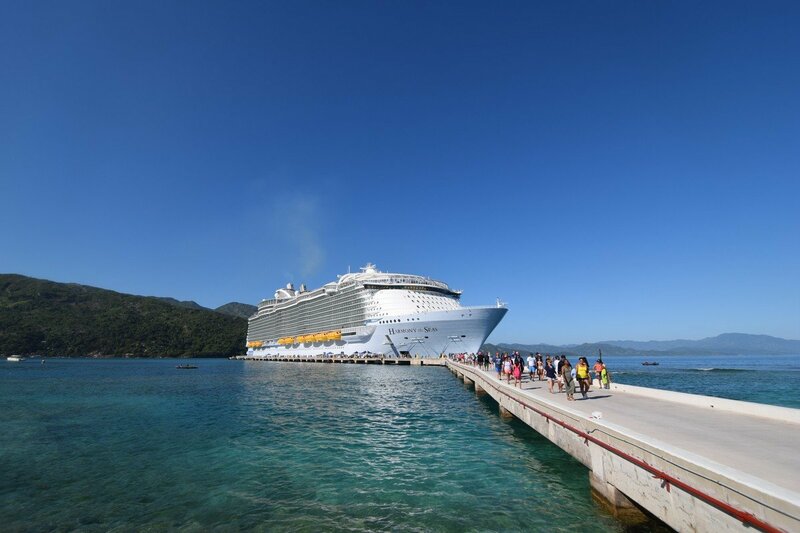 Our ship was the first Royal Caribbean ship to visit Labadee since Hurricane Irma. 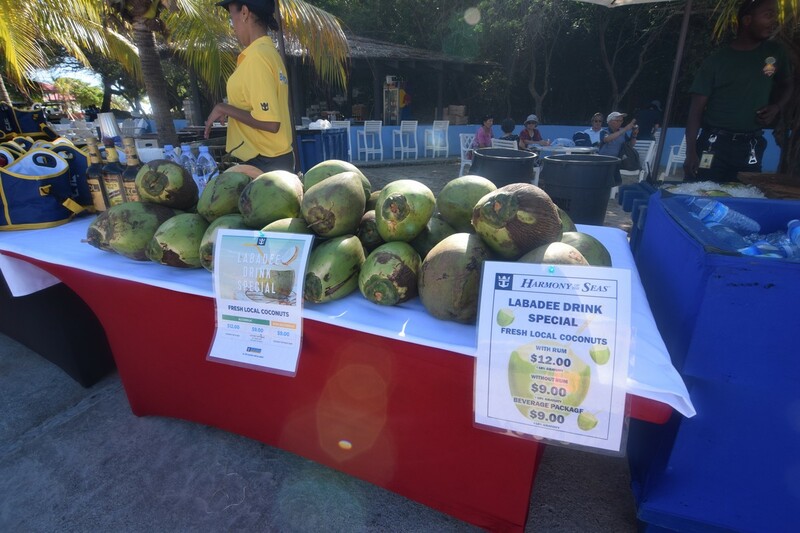 Check out this coconut drink special on Labadee. 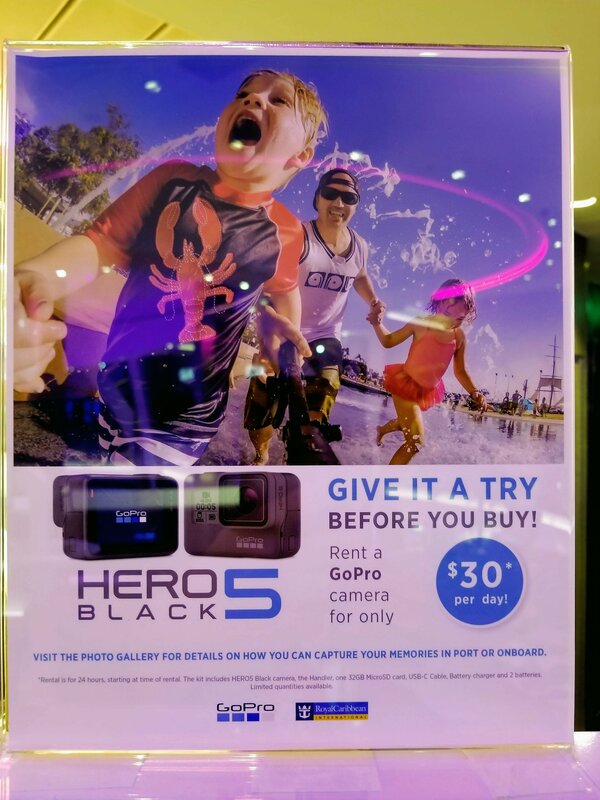 You can evidently rent a GoPro onboard Harmony of the Seas. Interesting idea.